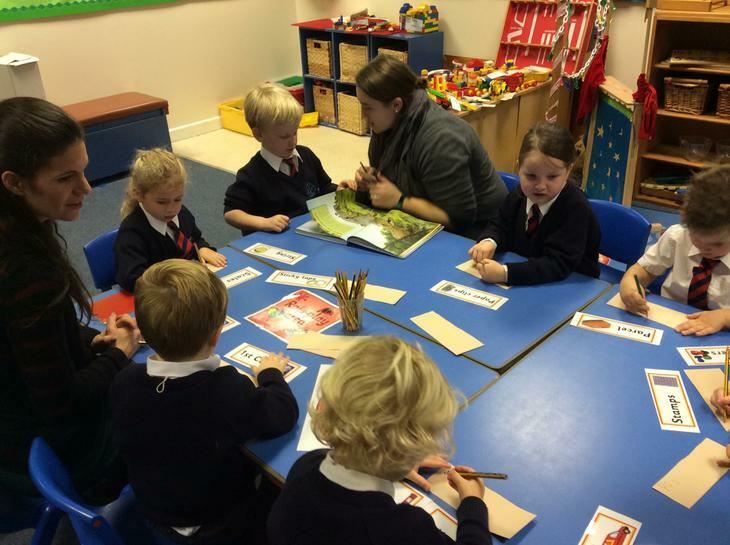 Mrs Pemberton teaches Red Class for the rest of the week. 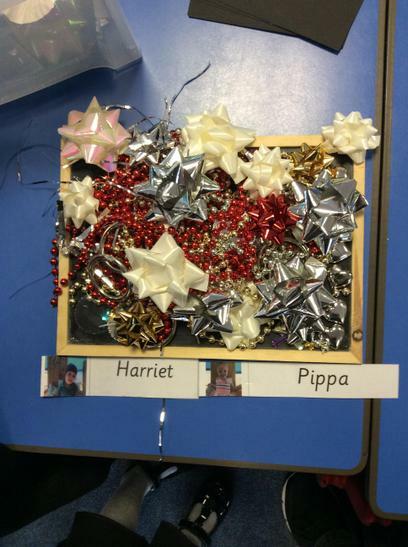 Our amazing classroom assistants are Miss Hardwick and Mrs Bush. 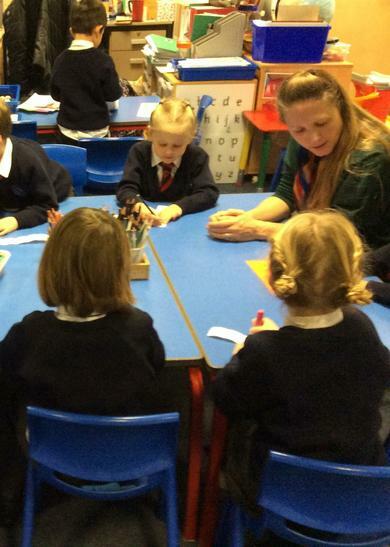 We also have Mrs Palmer ,Mrs Orme and Miss Friend who are supporting individual children. 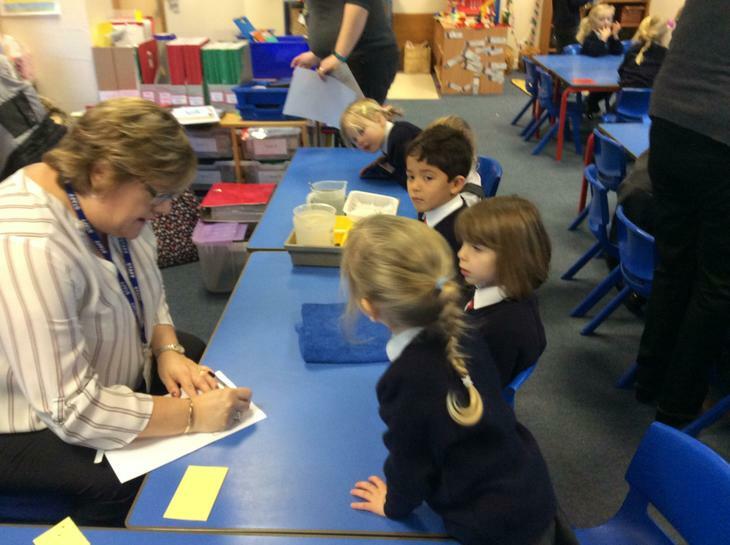 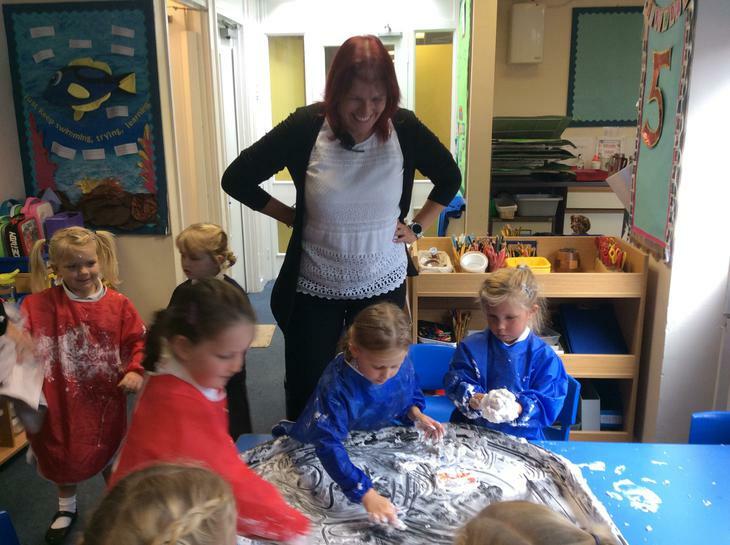 A big THANK YOU to Mrs Williams, Mrs Stoves and Mrs Hancock who come in to help us. 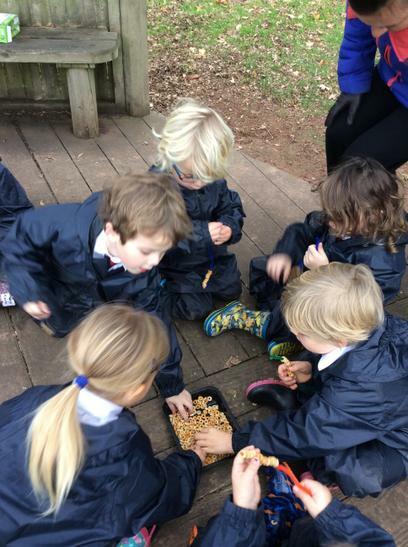 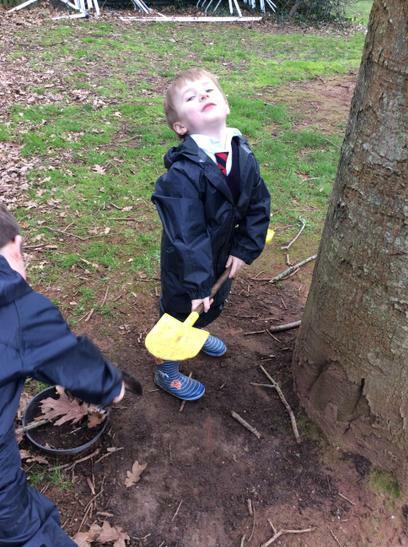 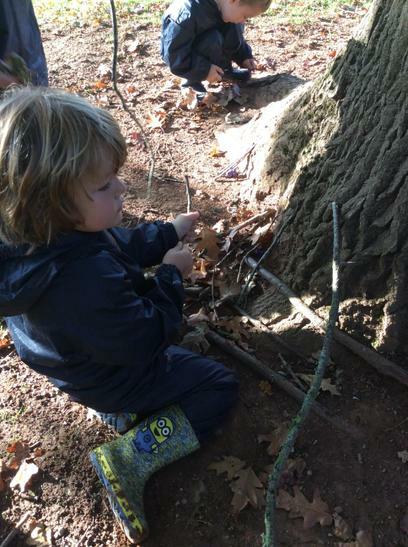 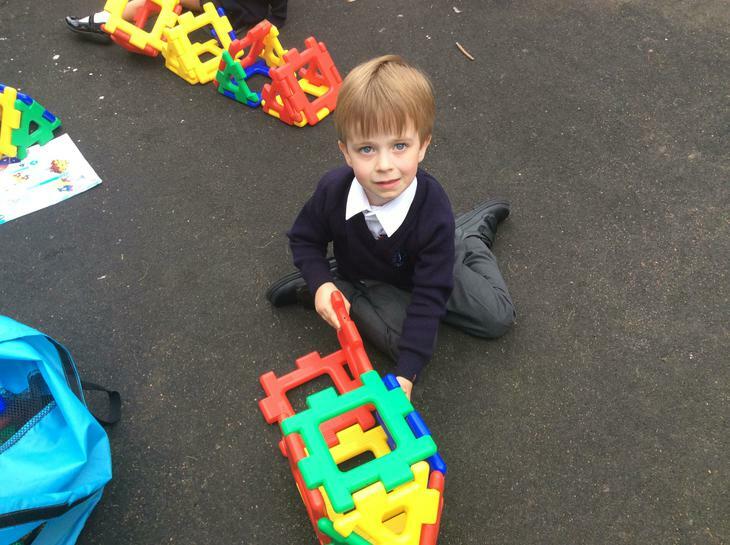 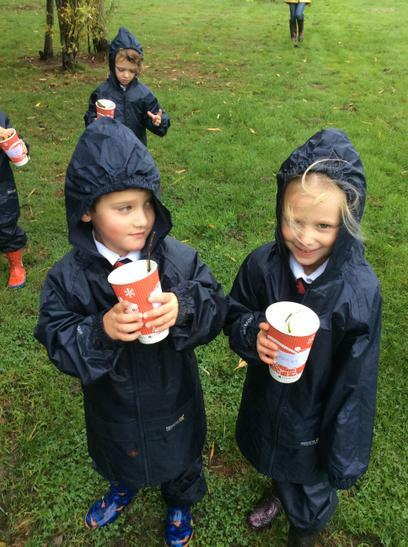 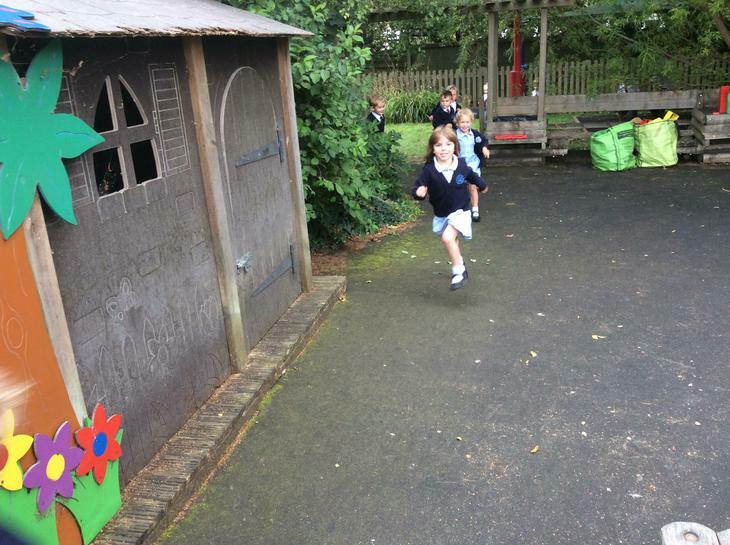 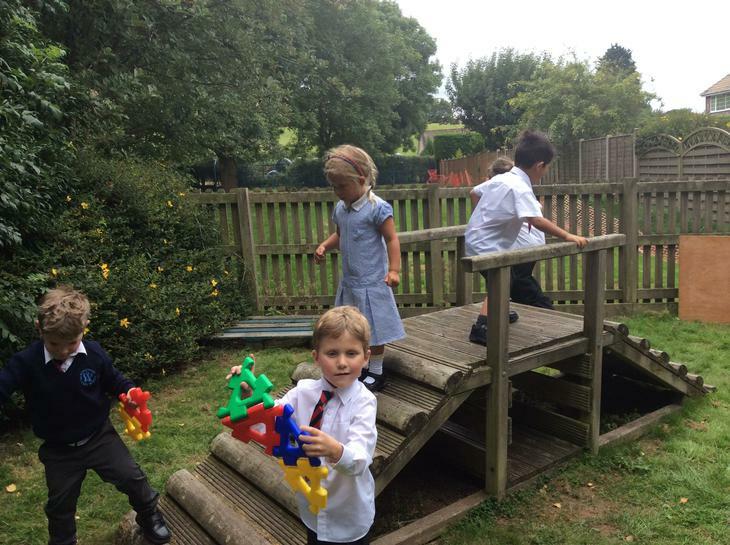 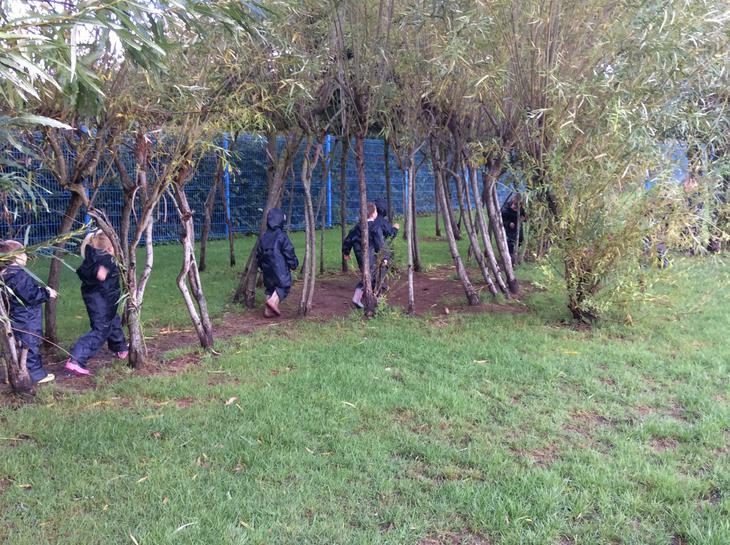 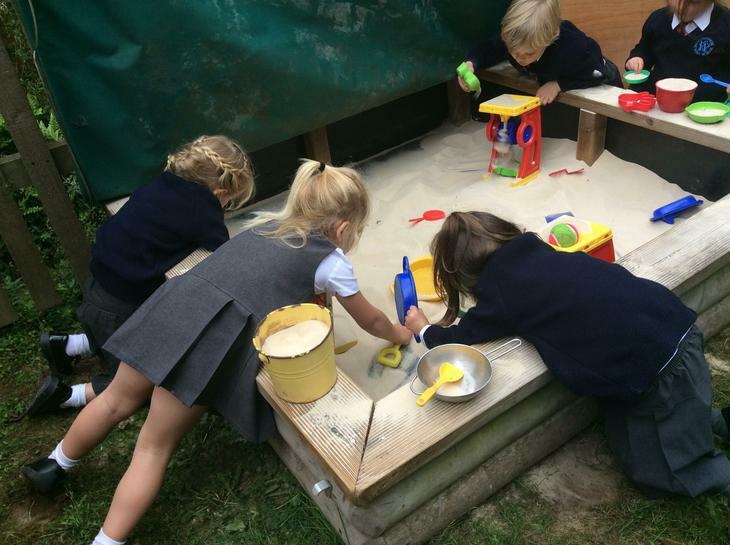 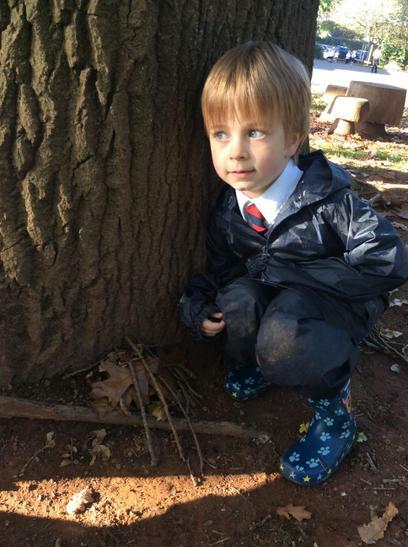 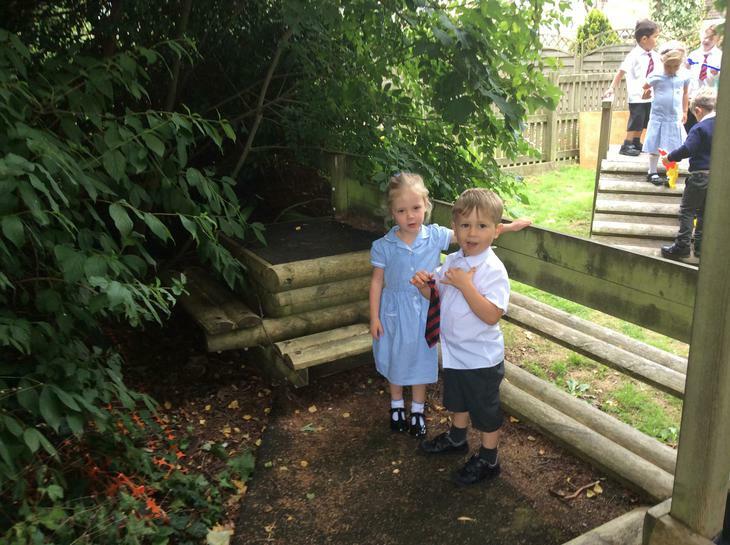 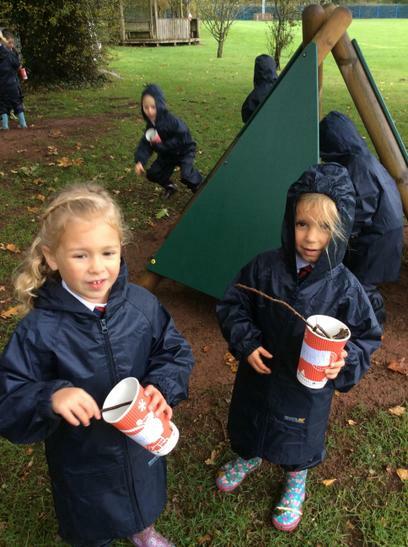 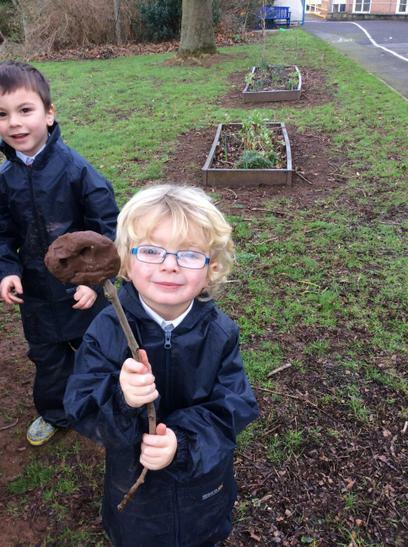 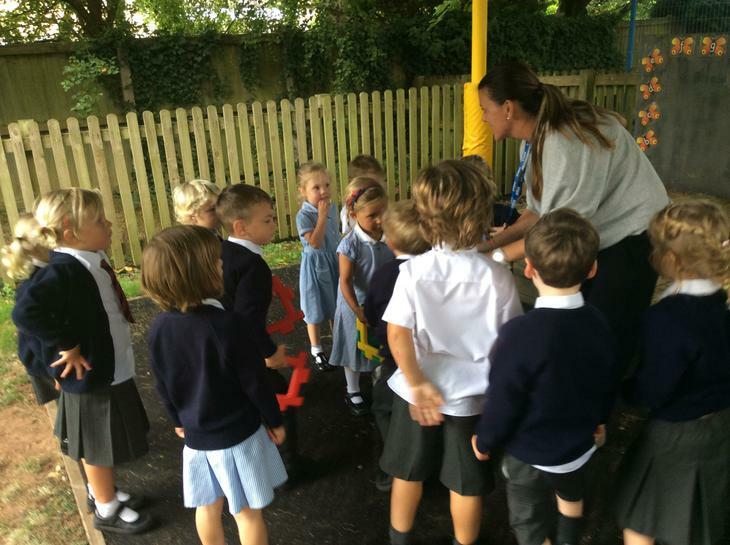 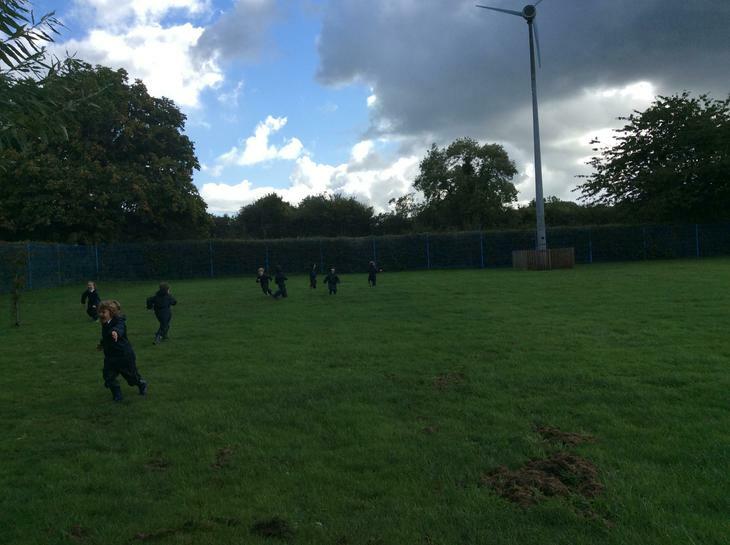 Outdoor Explorers- Some of the activities Red class have enjoyed so far. 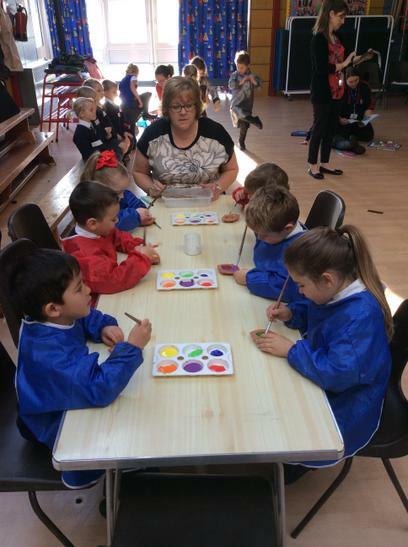 Thank you to Mrs Stoves for all of her help. 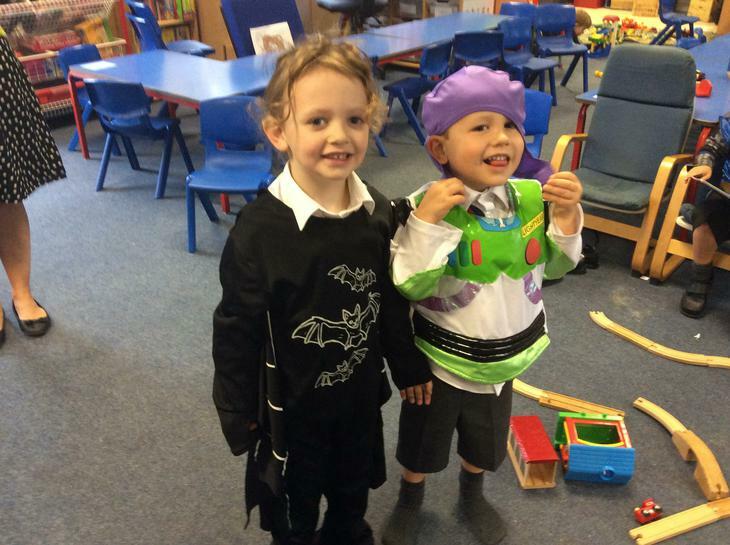 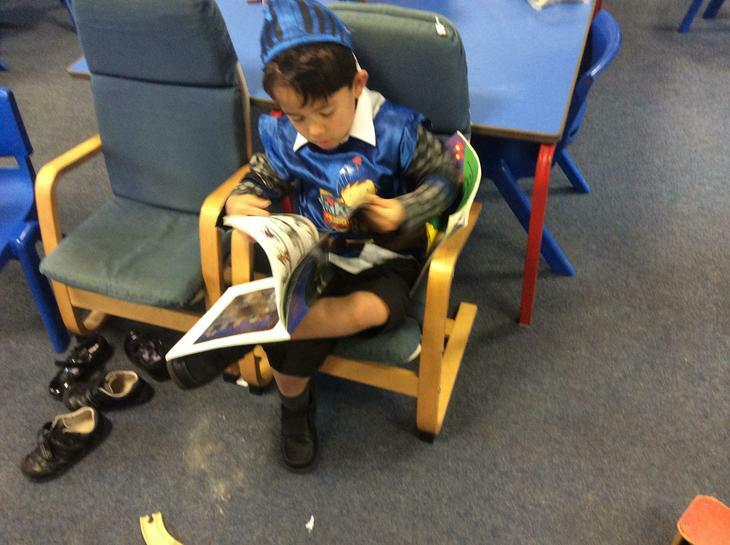 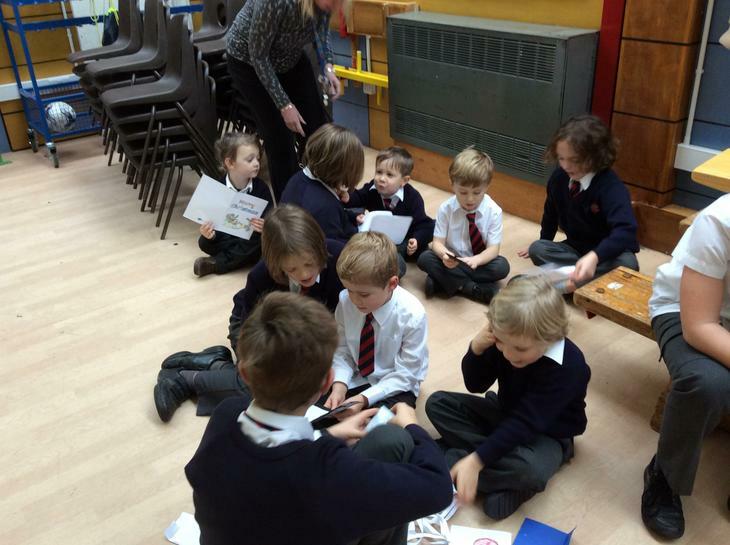 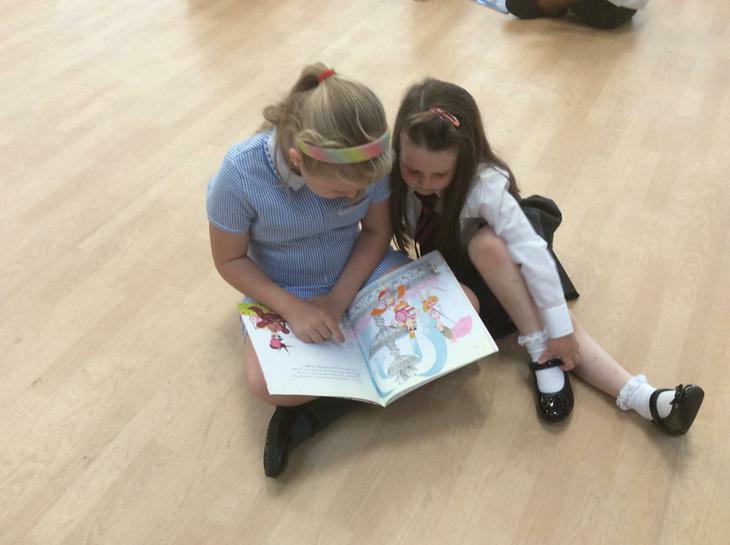 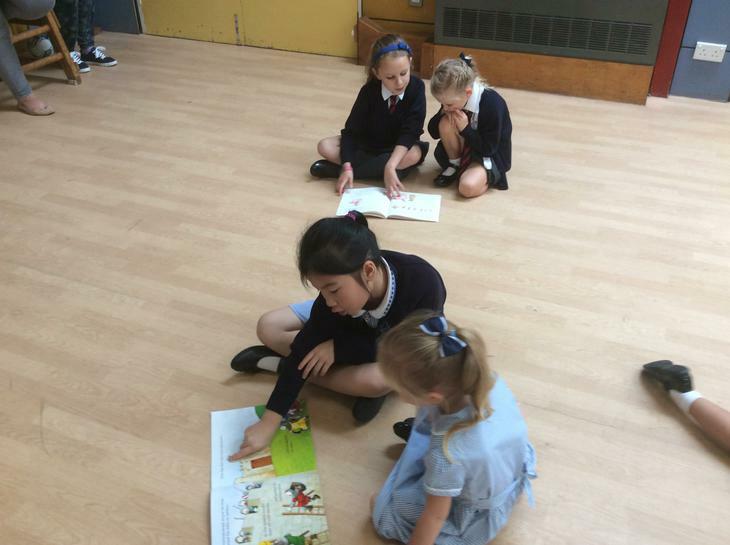 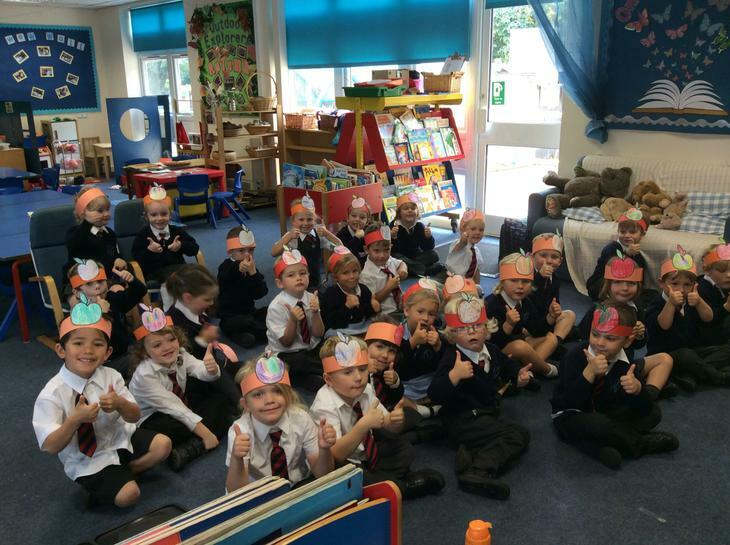 Red Class celebrated World Book Day. 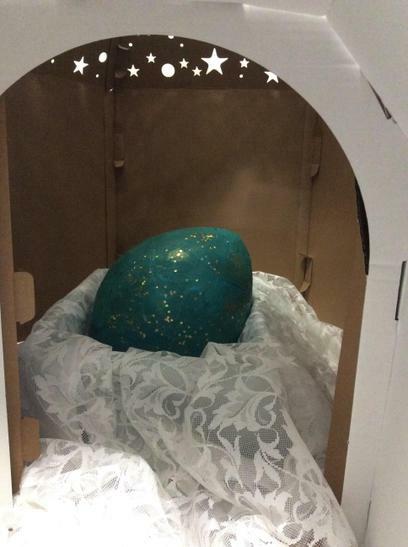 It's a boy. 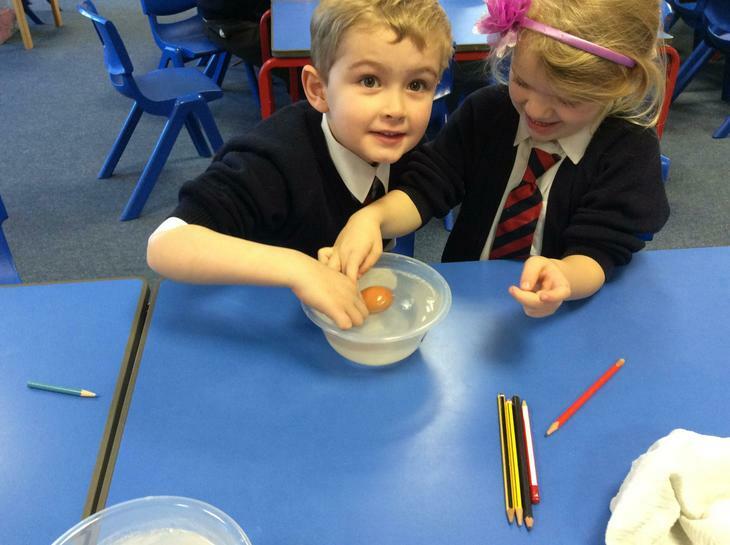 A baby triceratops has hatched out of our egg. 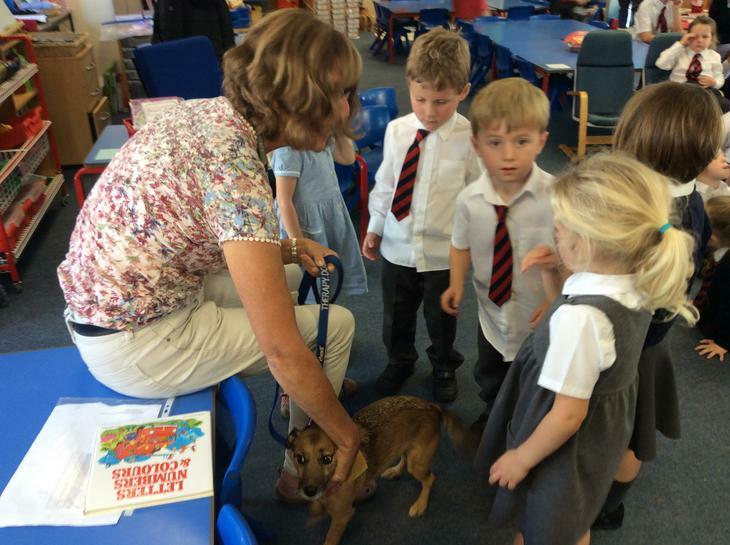 We have called him Spikey and we are going to take it in turns to look after him for a night. 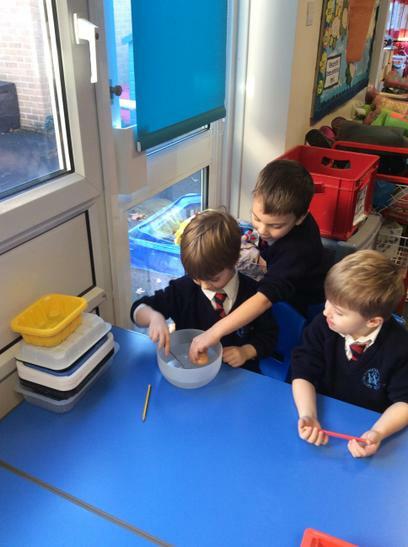 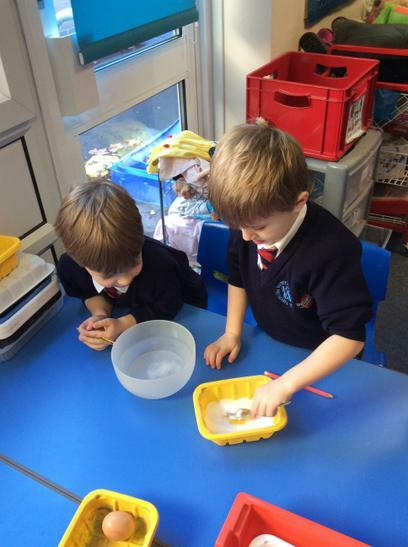 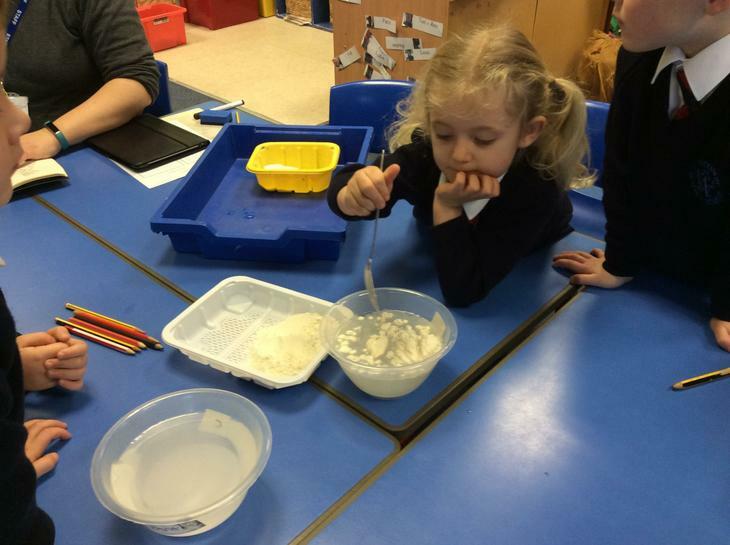 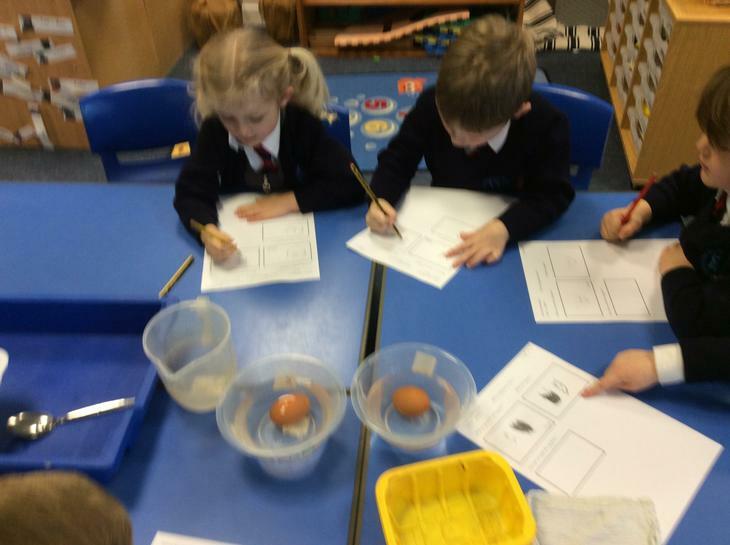 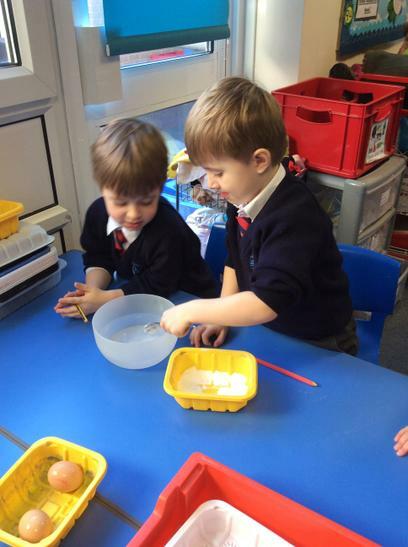 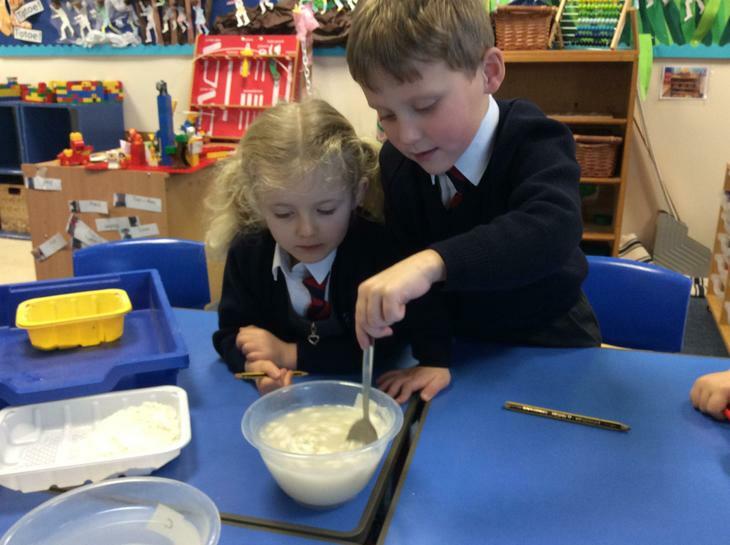 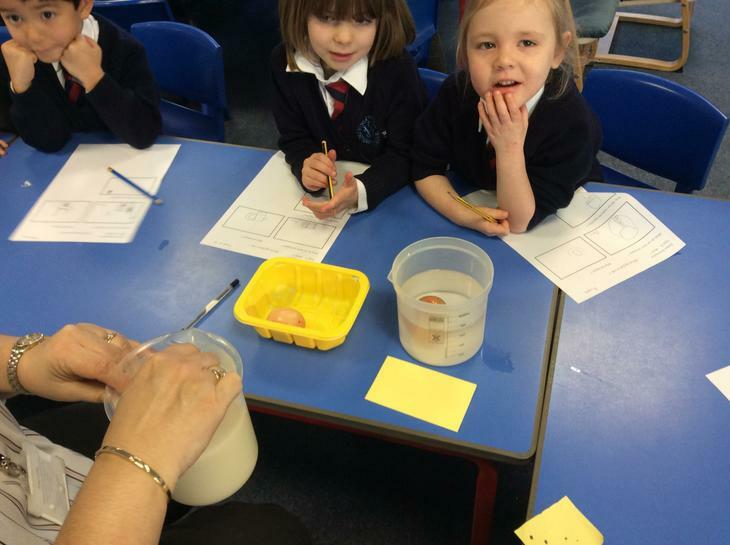 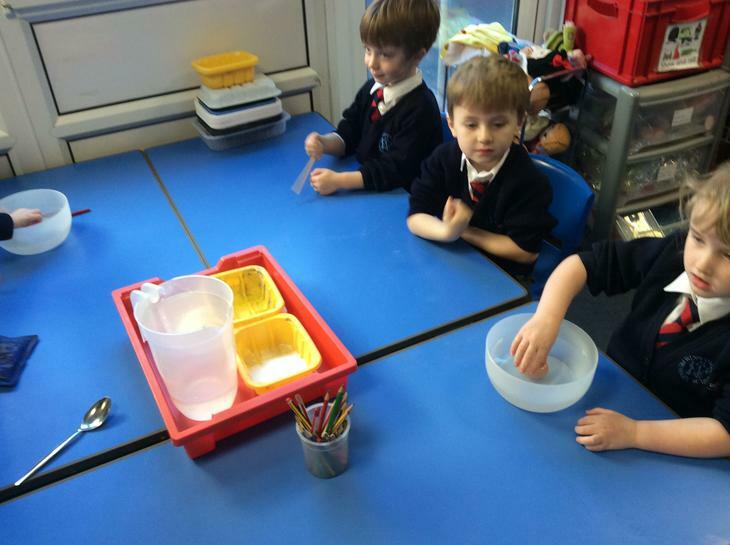 We have been investigating if eggs float or sink. 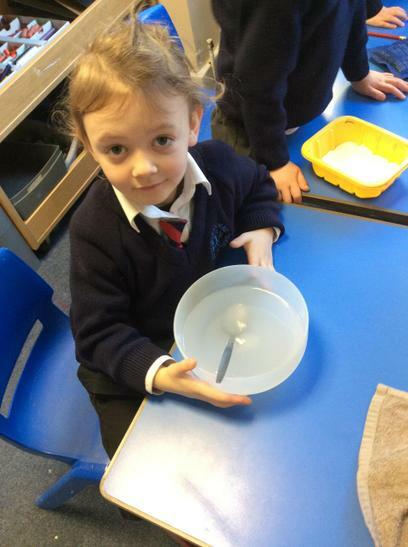 Ask your child what we found out. 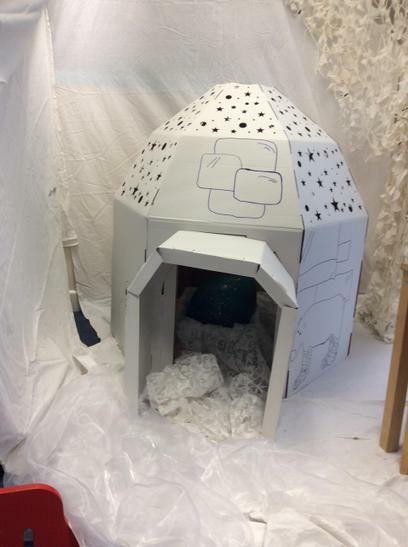 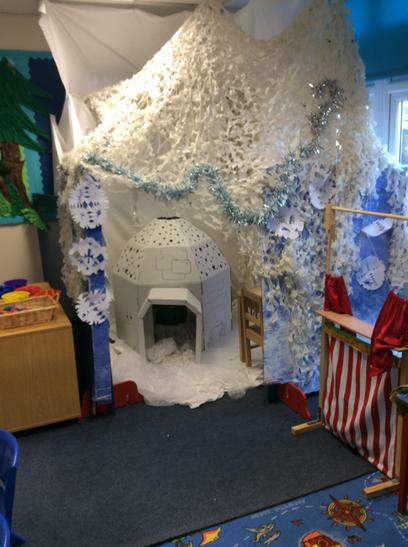 Look at the ice cave that we made in our classroom and what we found in it. 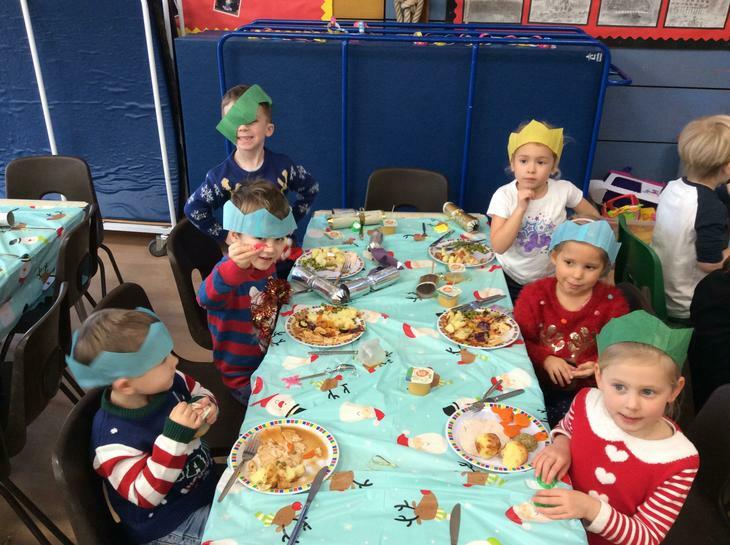 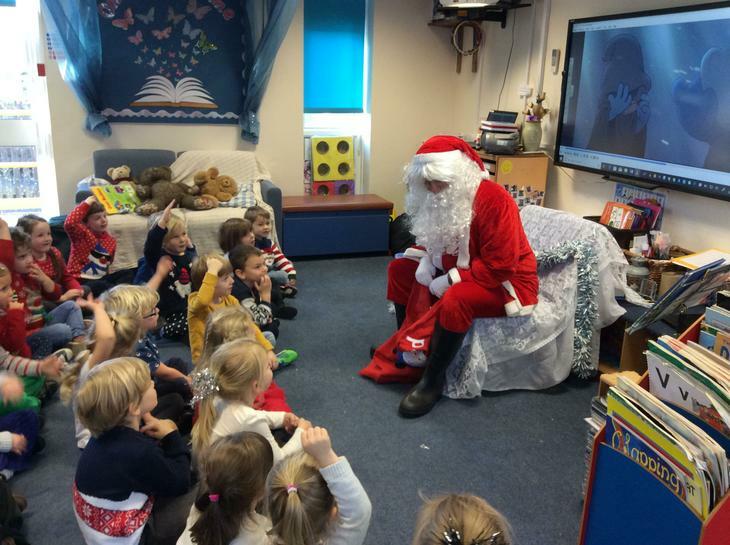 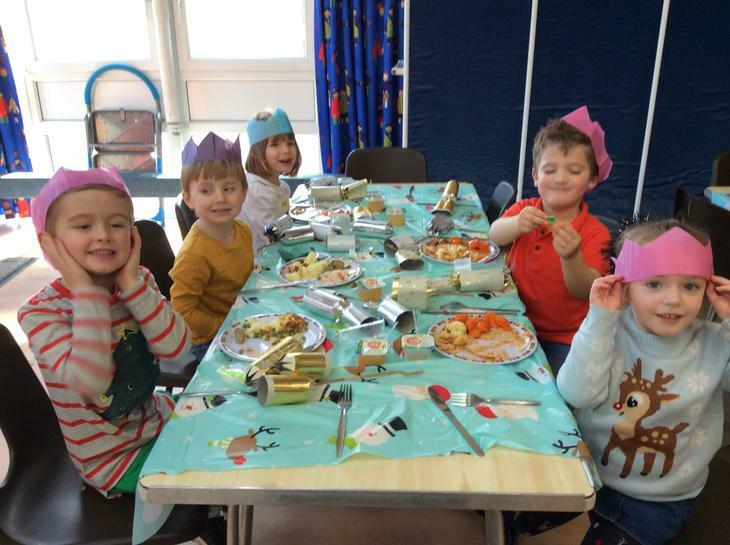 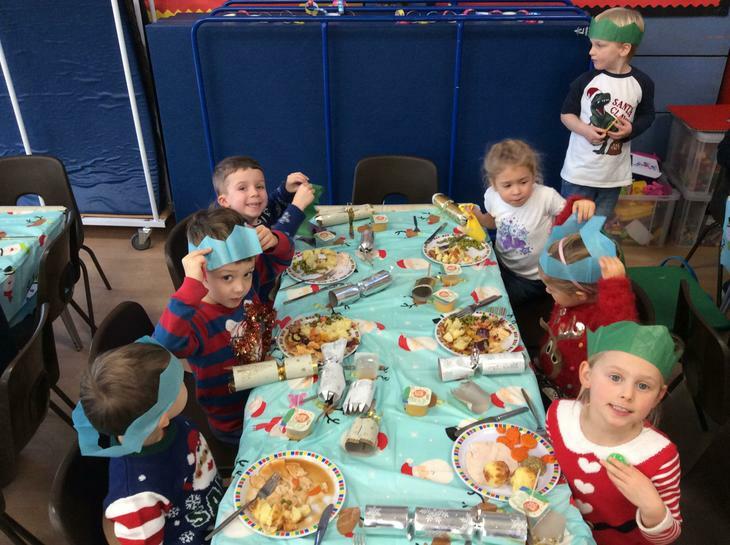 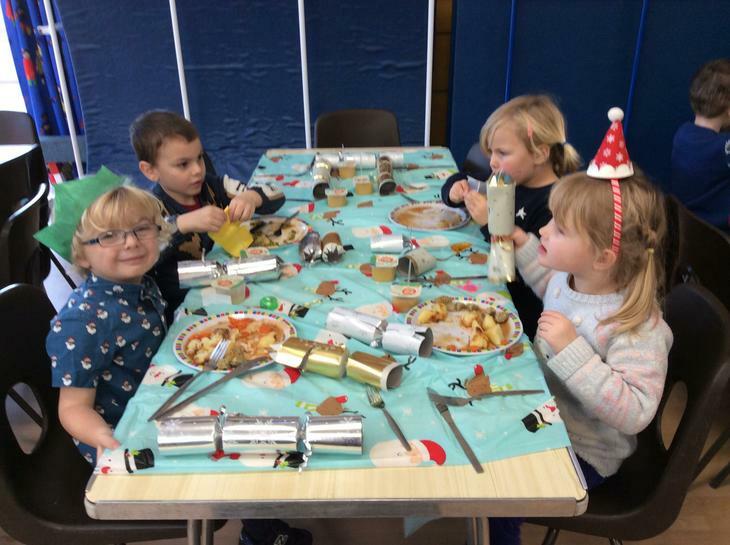 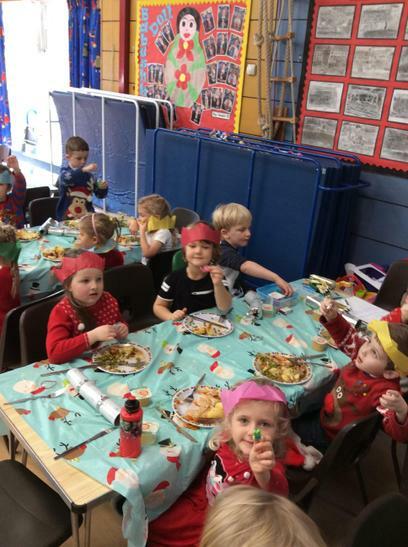 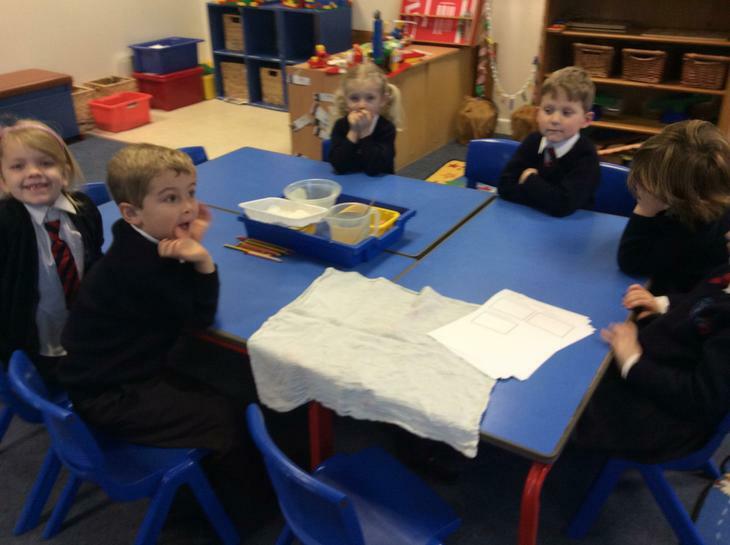 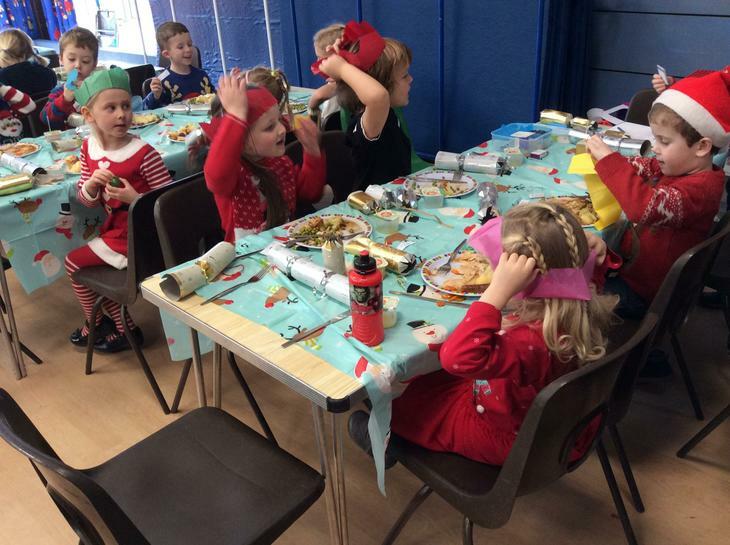 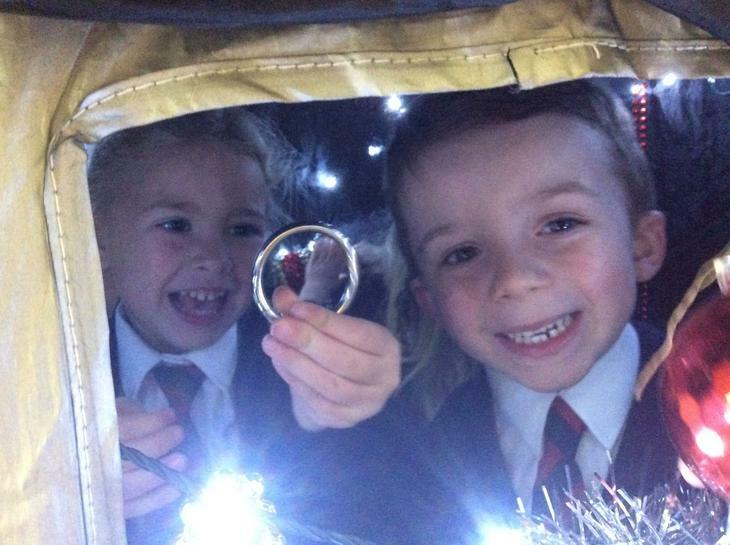 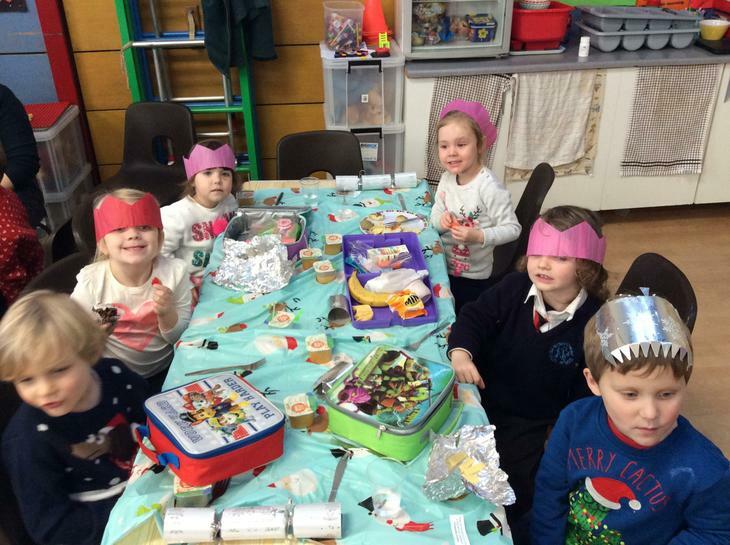 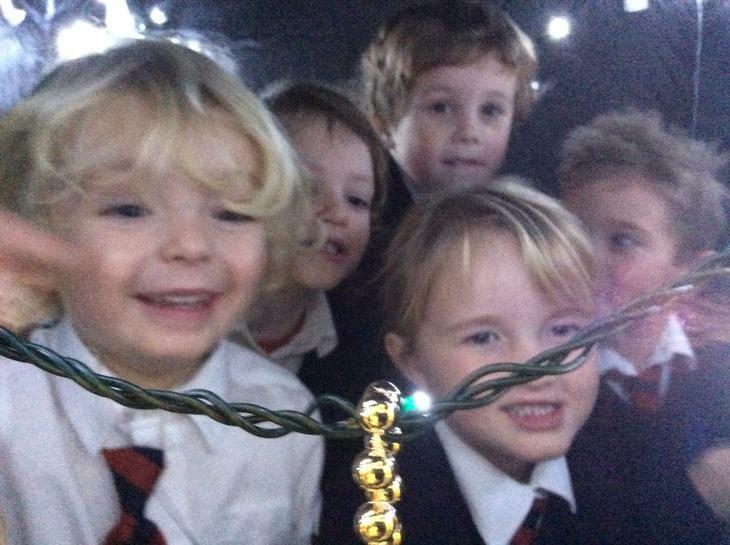 Red Class celebrate Christmas. 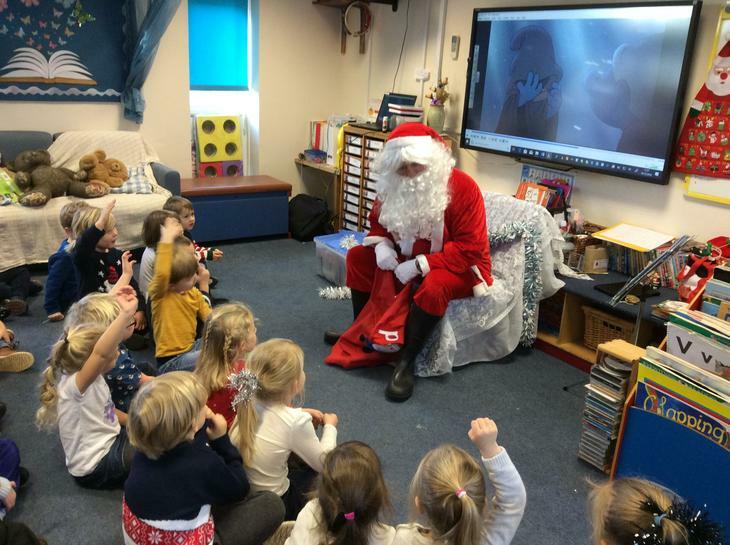 We had a special visitor who gave us presents. 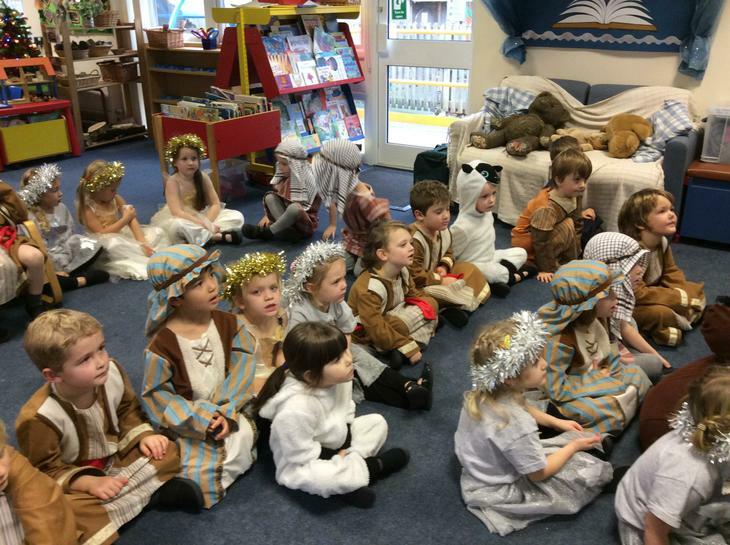 We performed a Nativity play with the rest of Key Stage 1. 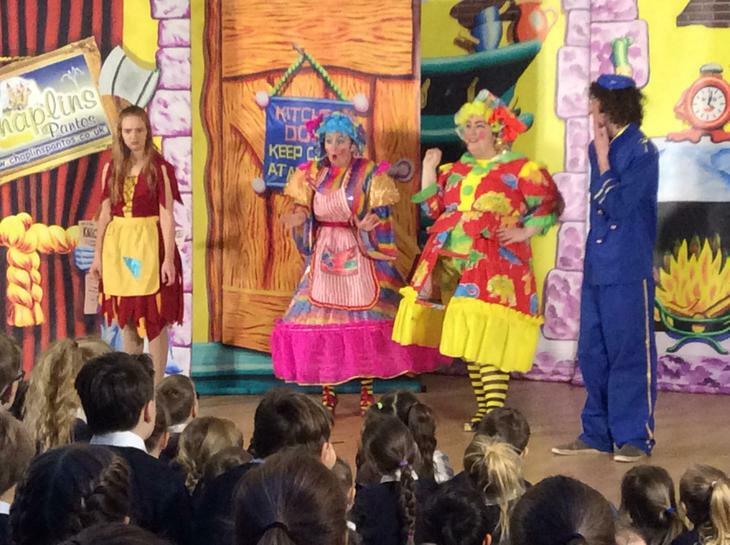 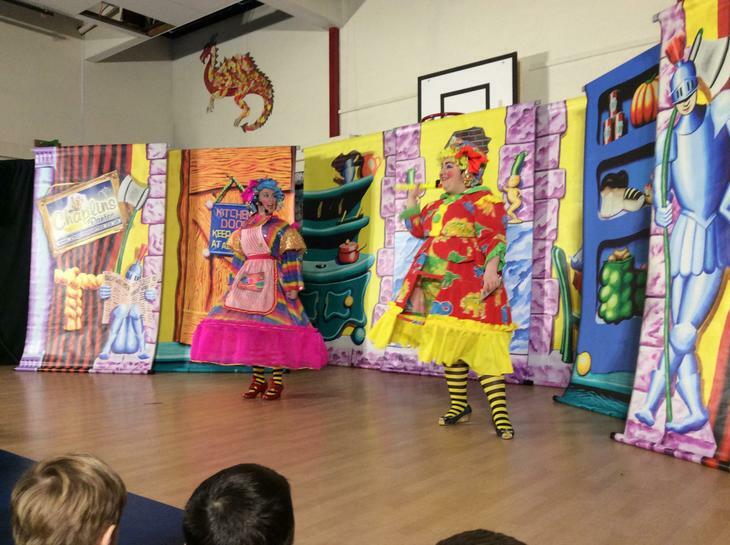 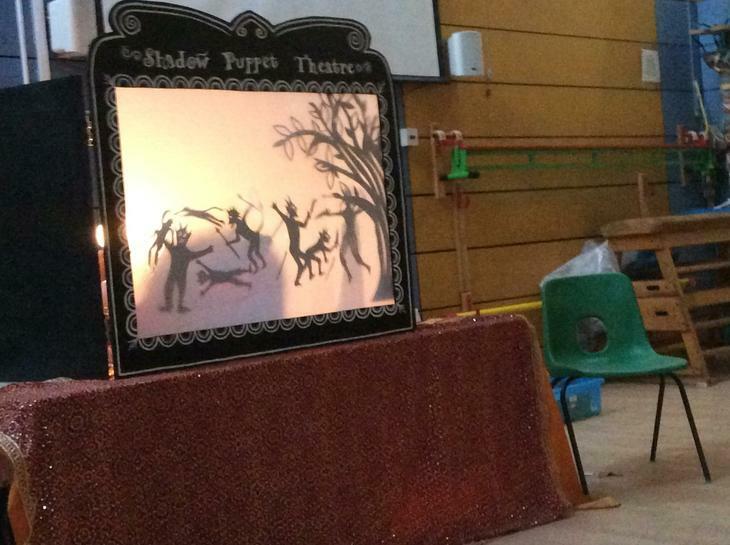 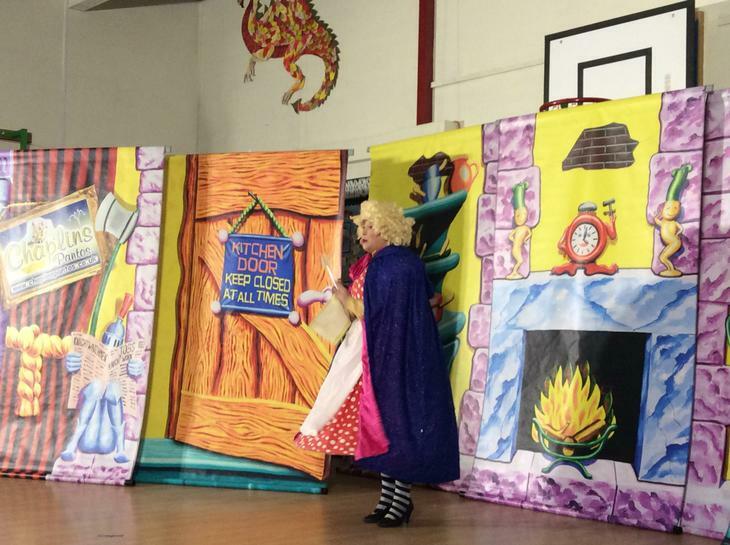 We watched a pantomime with the rest of the school. 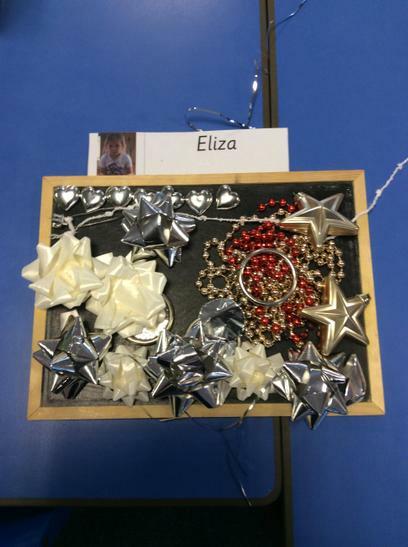 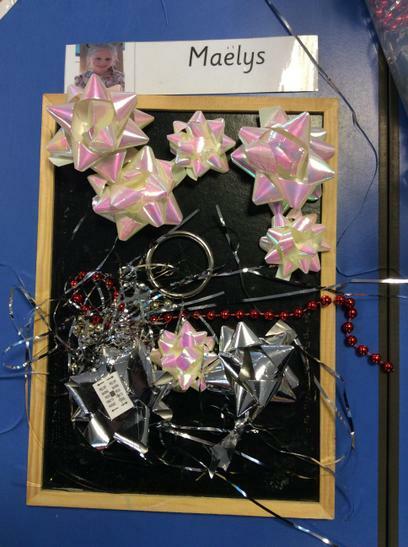 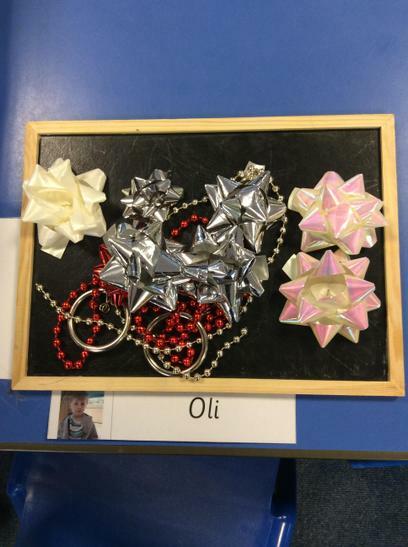 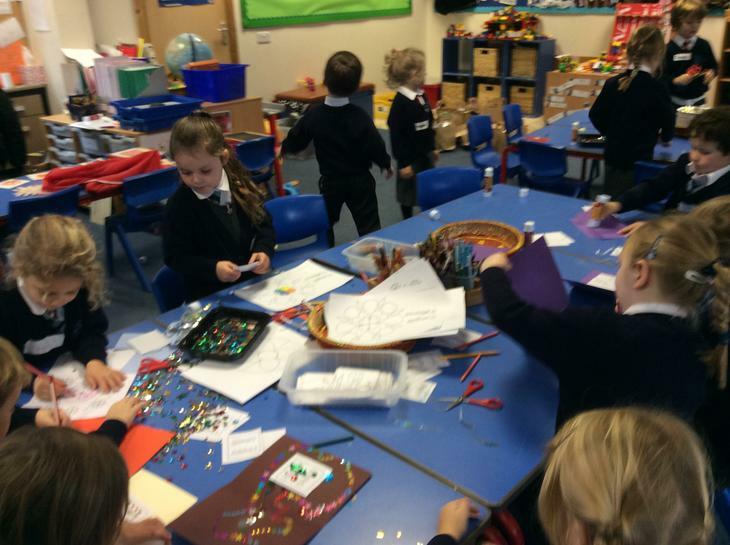 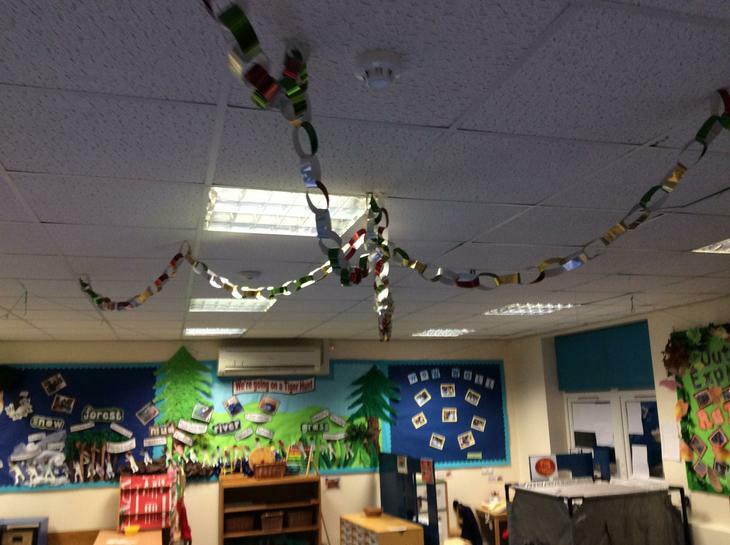 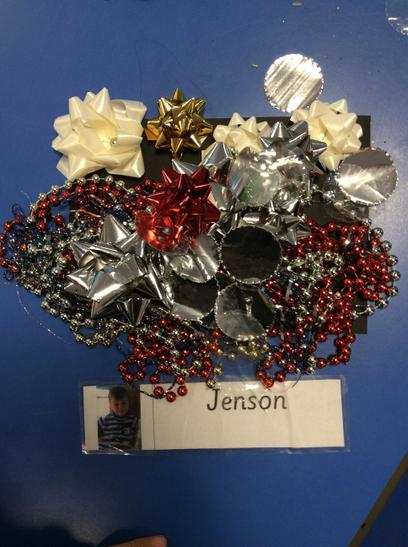 We also made lots of Christmas crafts. 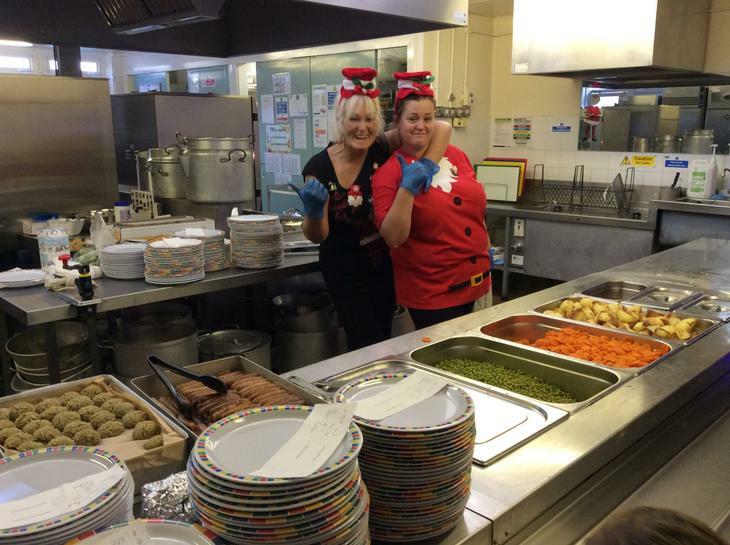 Thank you to all of the dinner staff for a fantastic Christmas dinner. 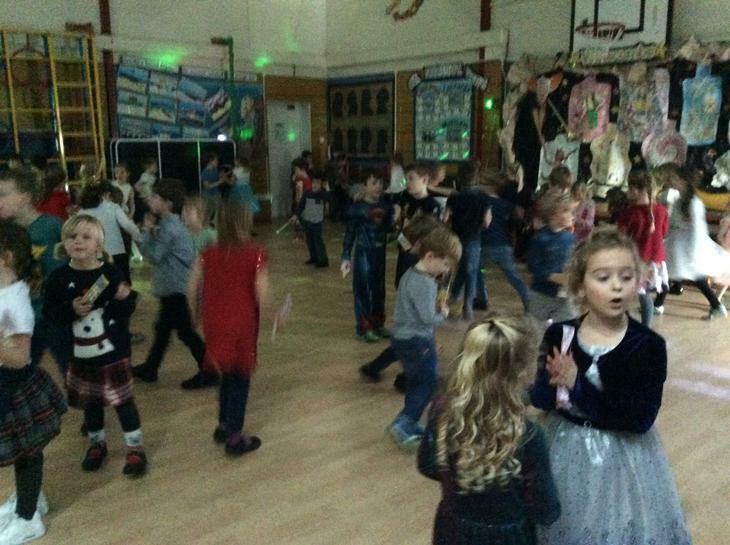 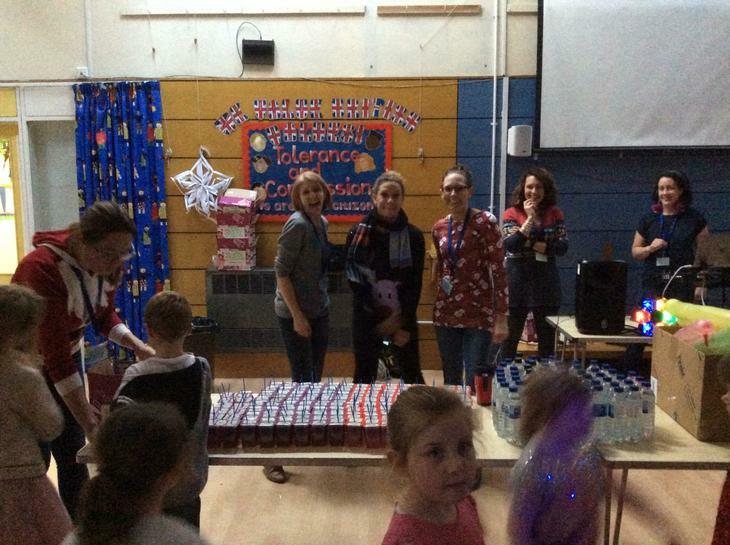 Thank you to our PTFA for an AMAZING Christmas disco. 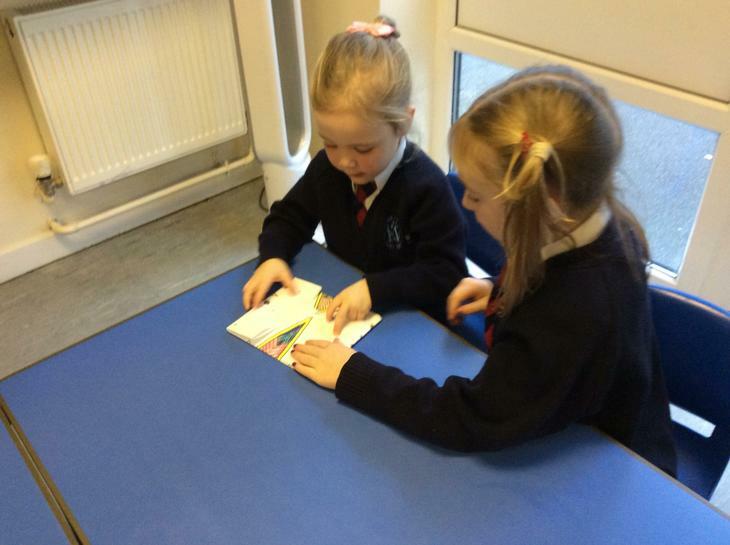 Thank you to Yellow Class for writing stories and wrapping them up for us. 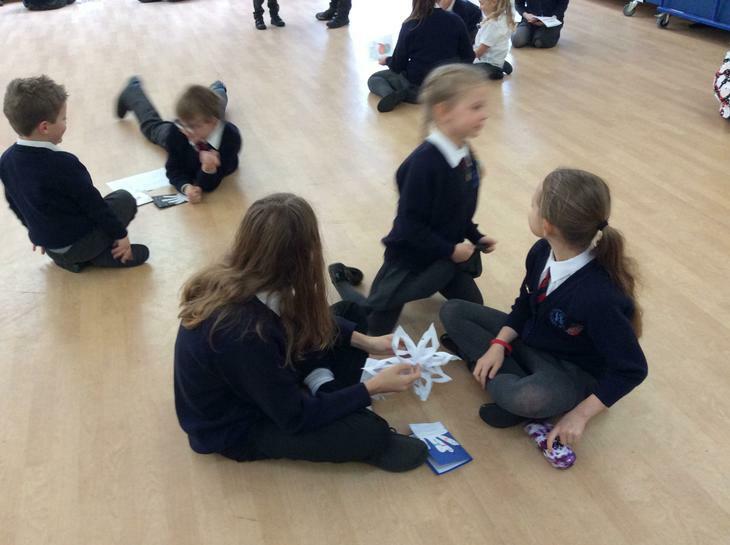 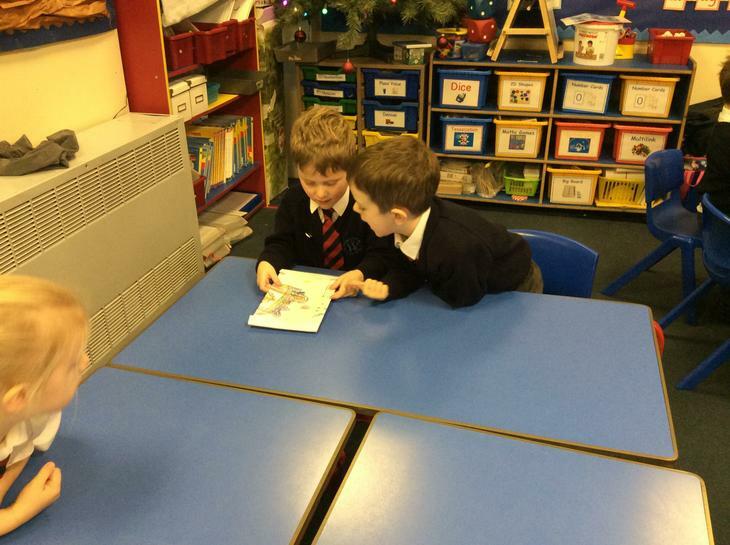 Thank you to our Reading buddies who made us cards and read Christmas stories to us. 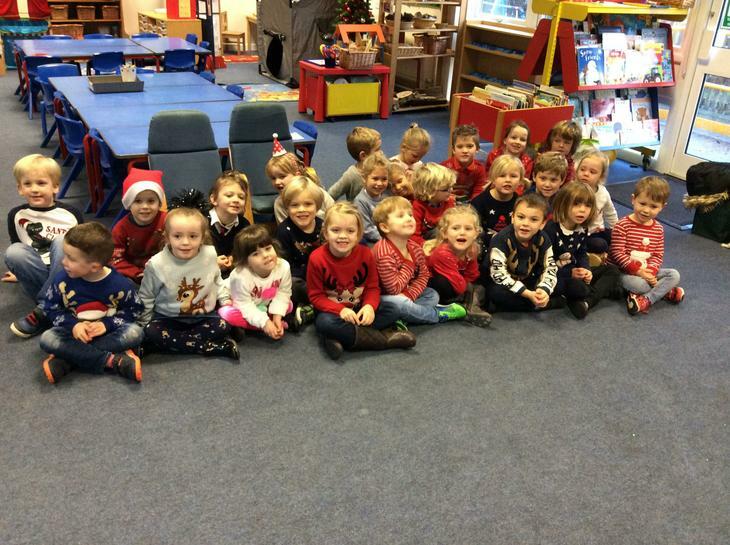 A very Merry Christmas from everyone in Red Class. 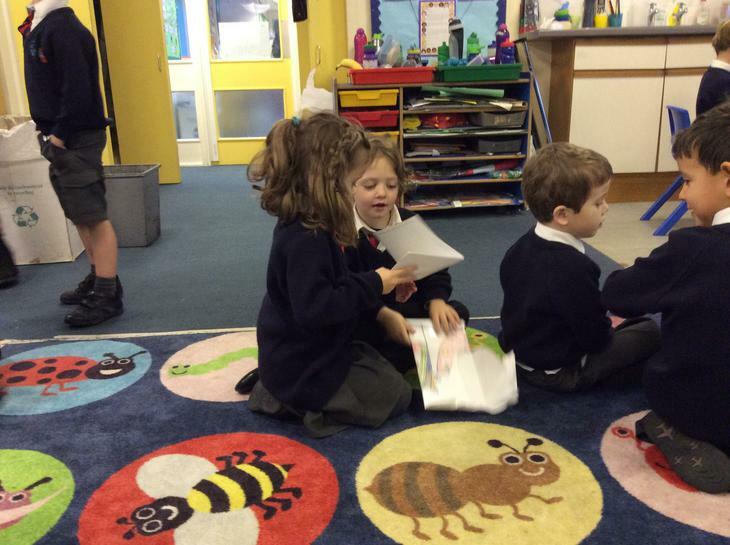 Thank you to Eliza's daddy and Pippa's daddy who came to read to us. 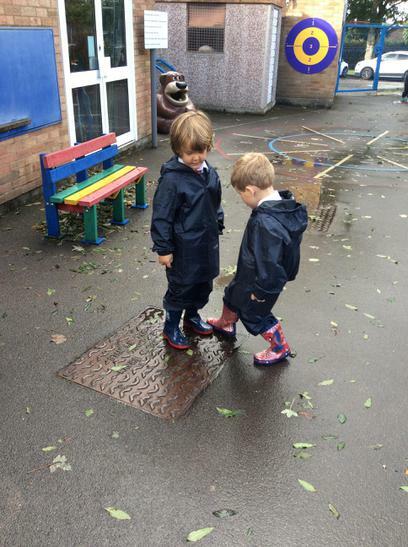 We loved your stories. 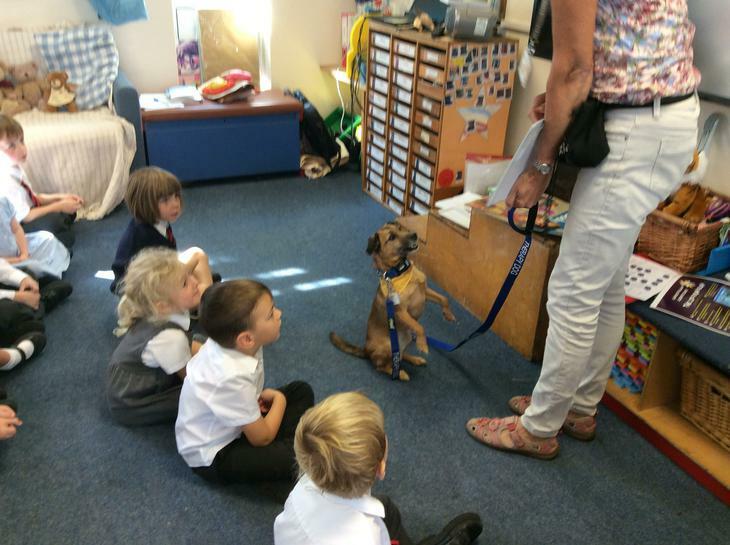 Red Class has a visitor this month. 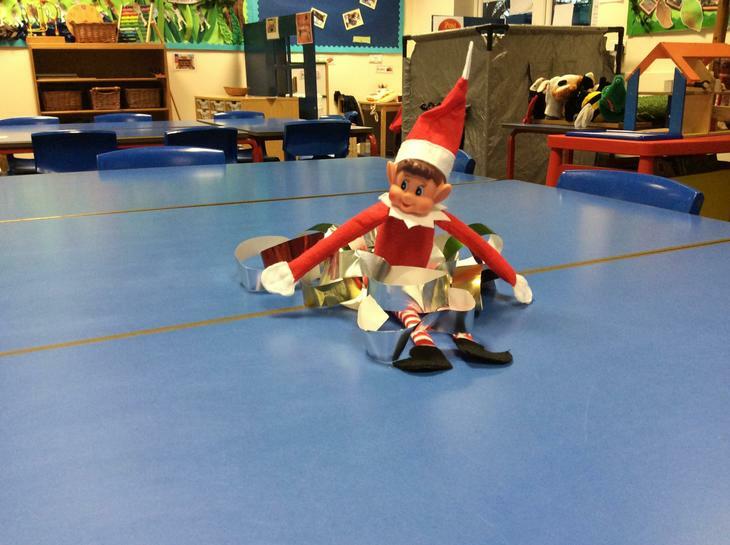 Rudy the Red Class Elf only does good deeds and helps us. 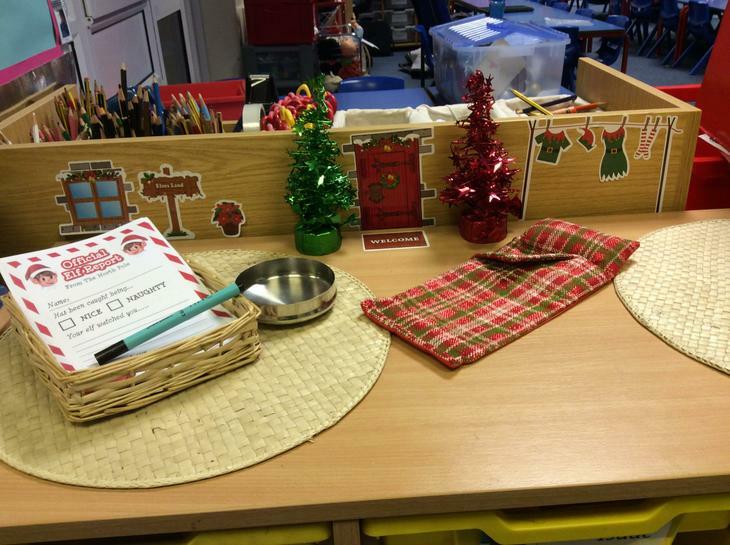 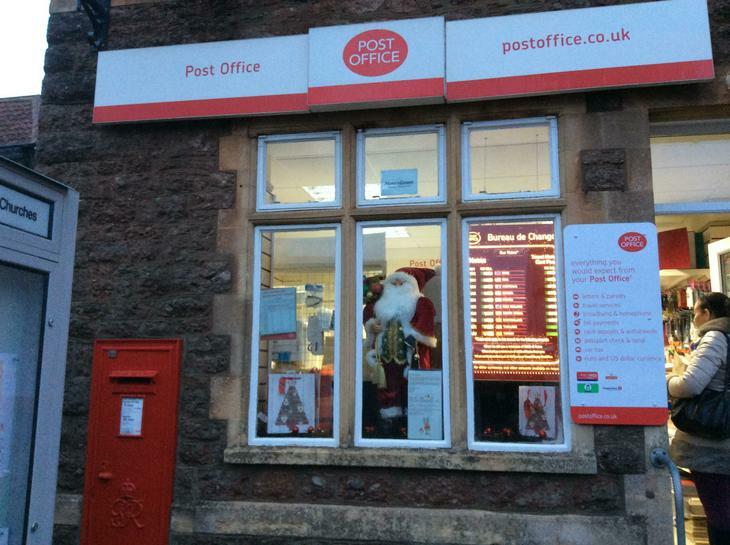 Rudy will be watching all the lovely things we do and sending elf letters home so parents know how kind and thoughtful Red Class have been. 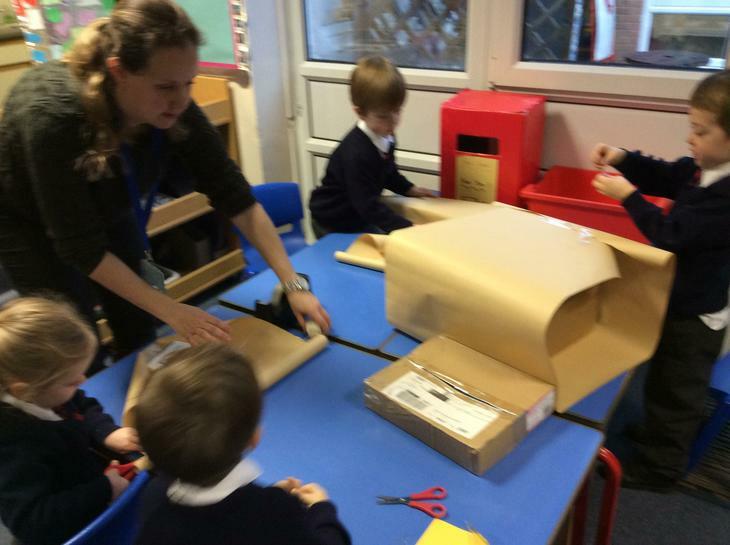 Unfortunately due to the weather forecast we couldn't go to the village Post Office however that didn't stop us making one in our classroom. 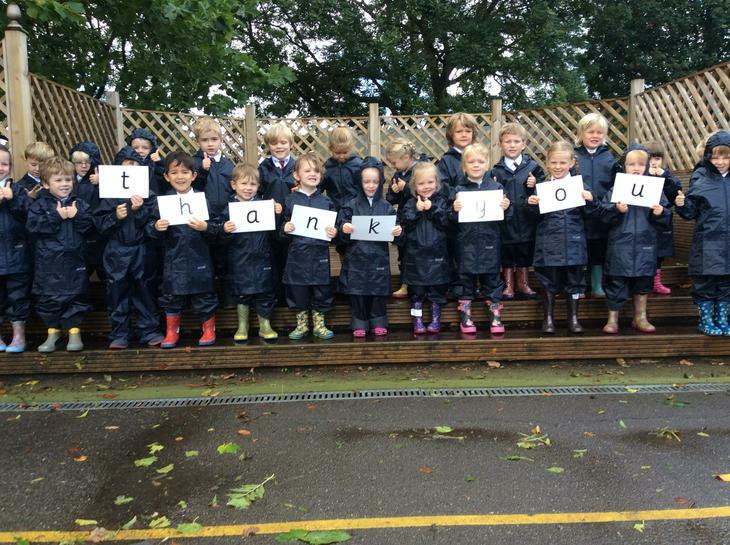 Thank you to our parents that helped us. 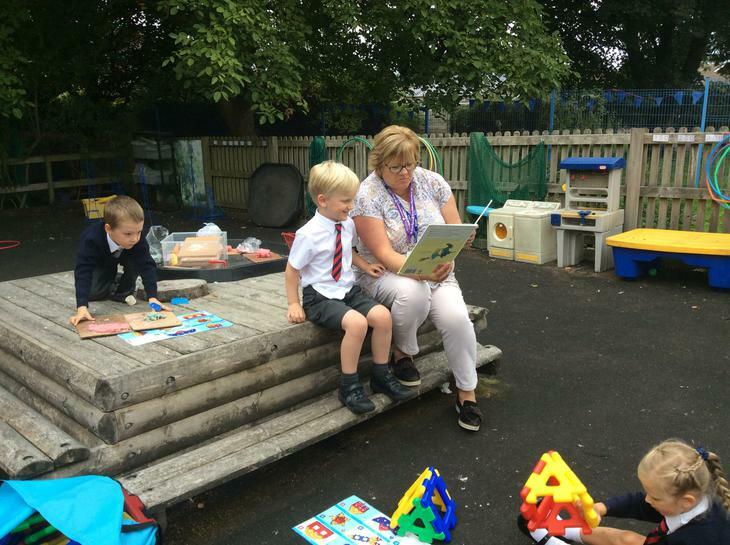 Thank you to James' mum, our first " Mystery Reader." 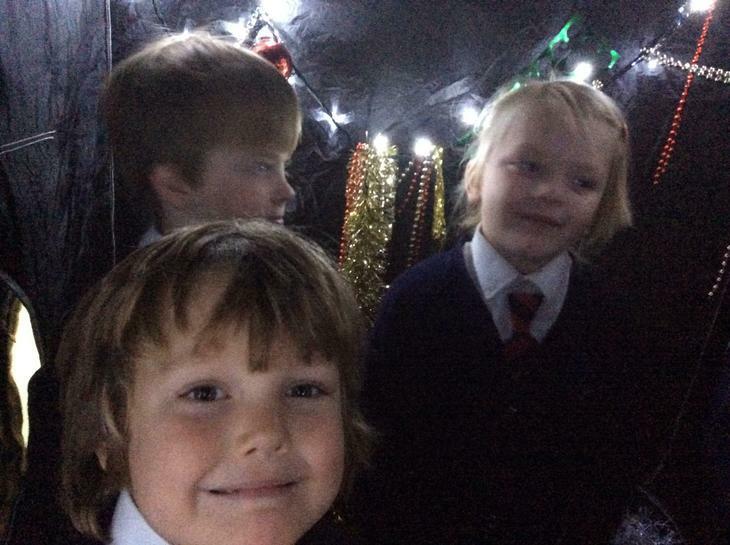 We have a dark den in our classroom. 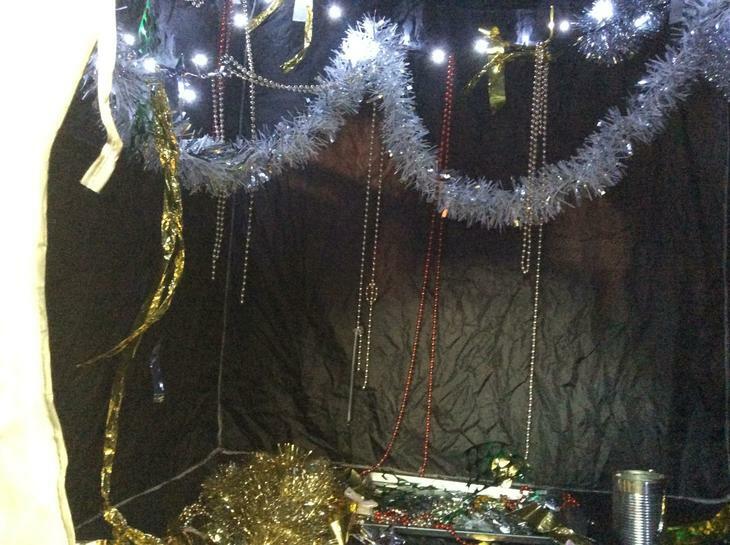 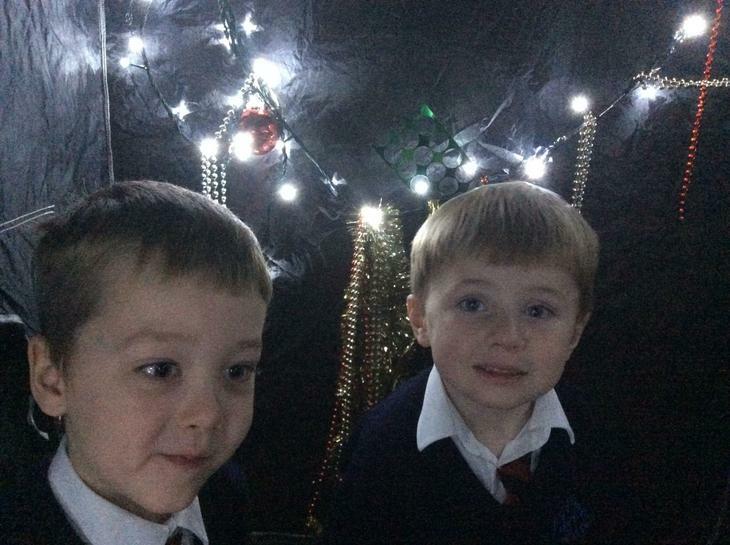 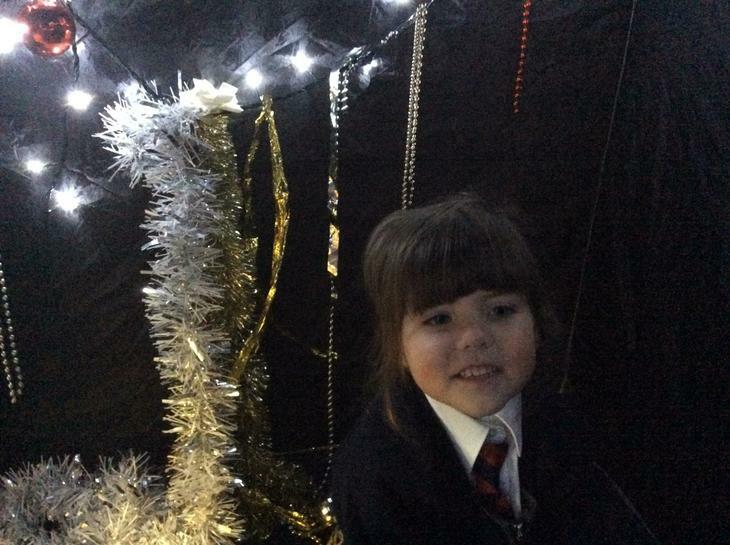 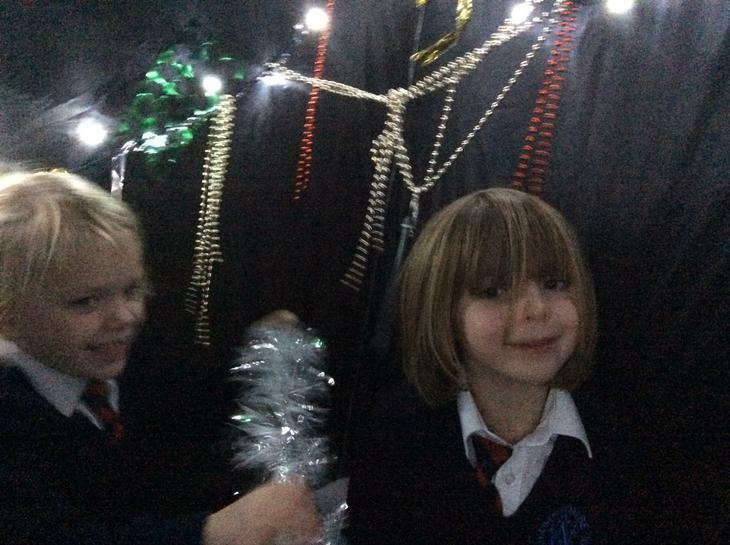 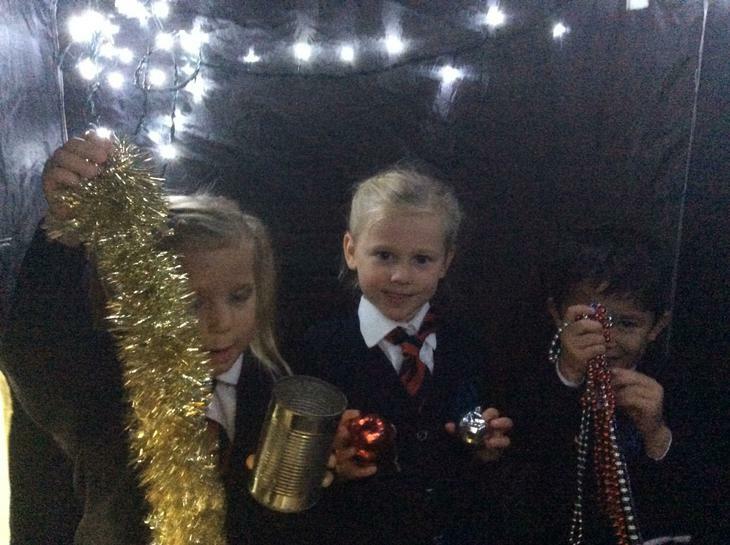 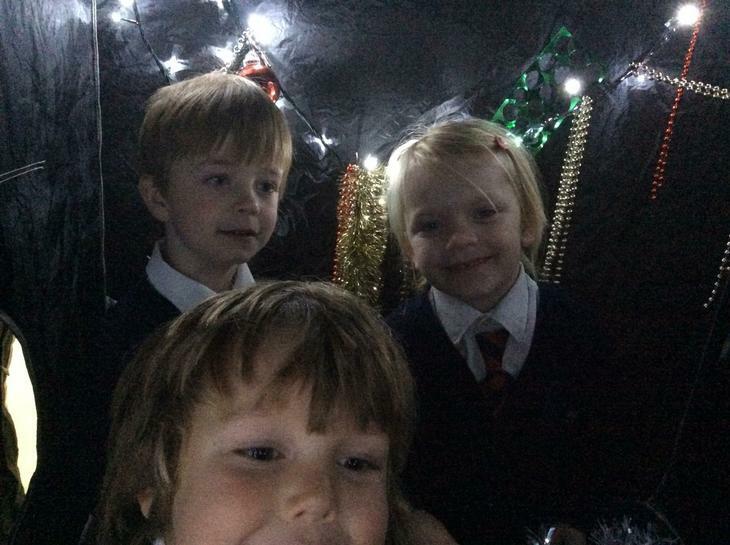 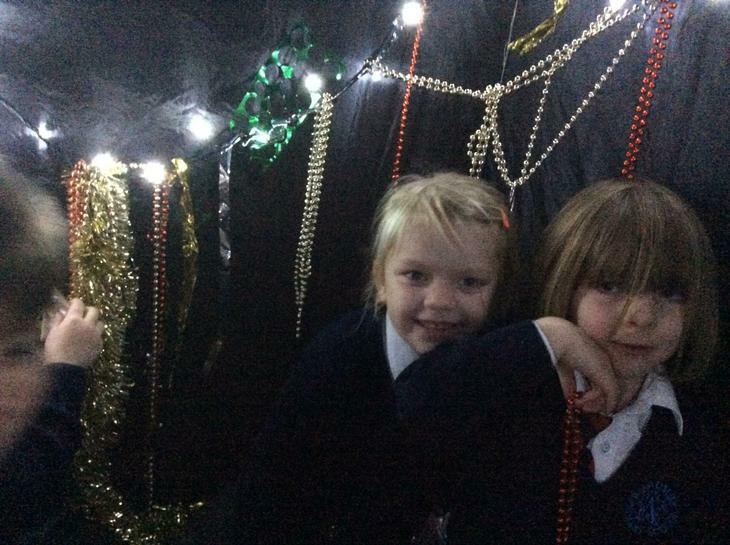 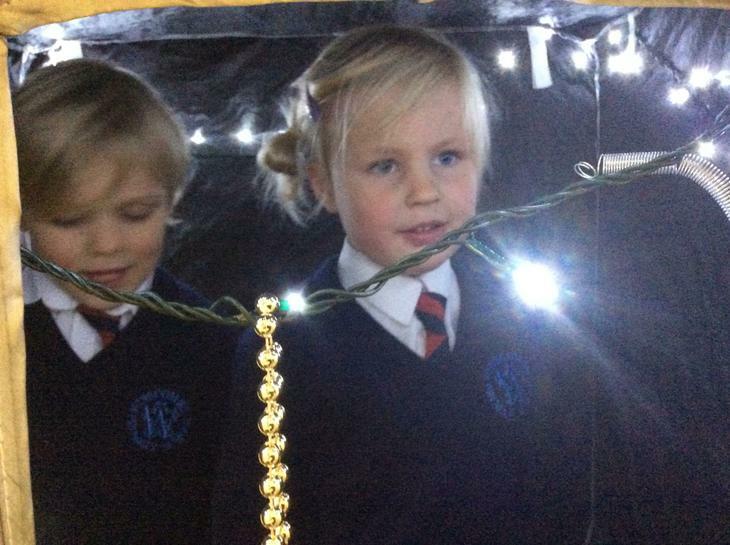 We decorated our den and explored light and dark. 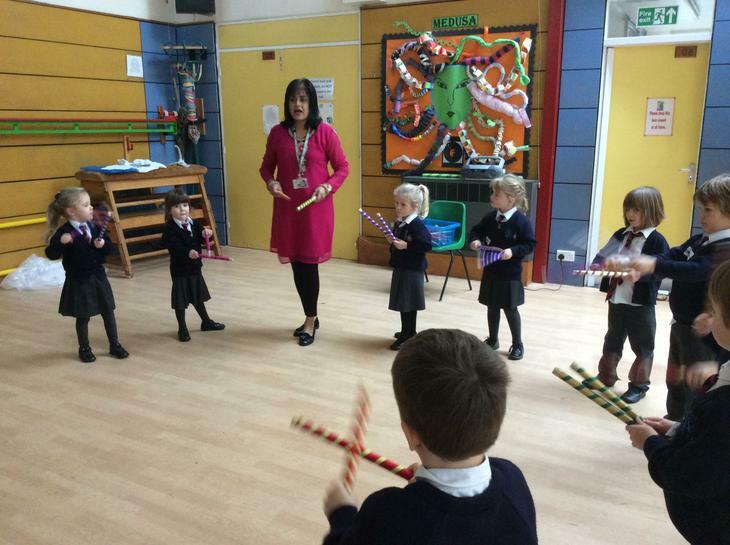 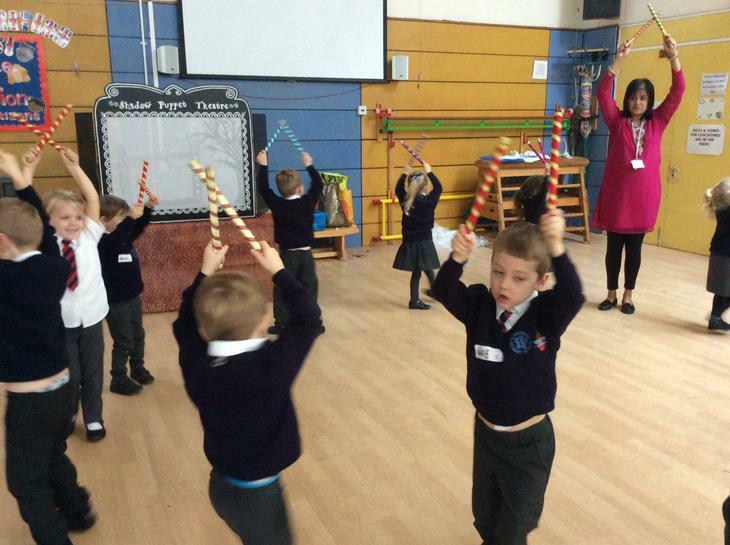 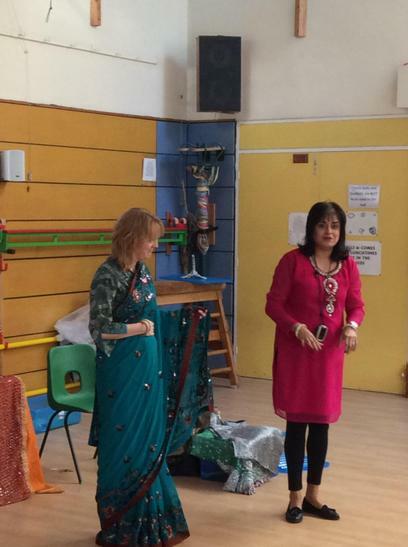 Thank you Mrs Mistry for teaching us about Diwali. 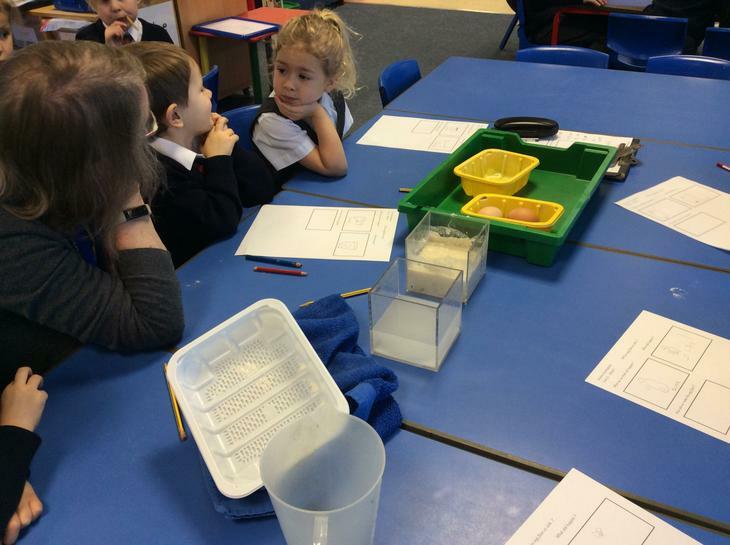 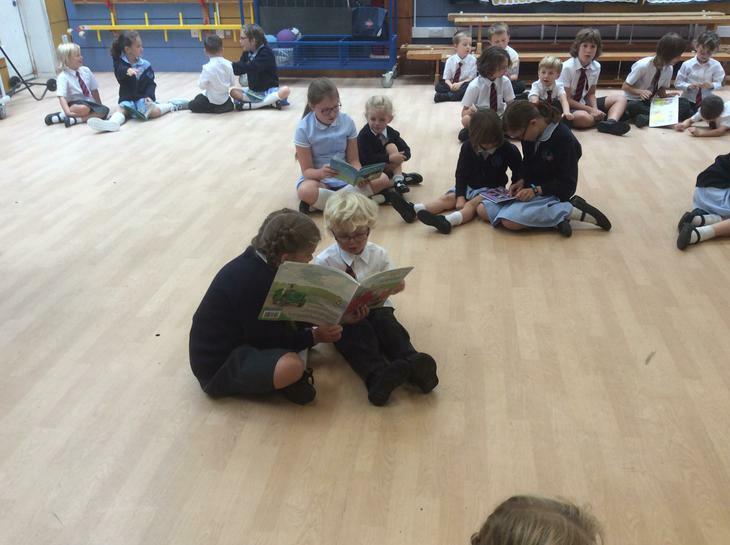 We had a lovely day with Class 1 from Sandford. 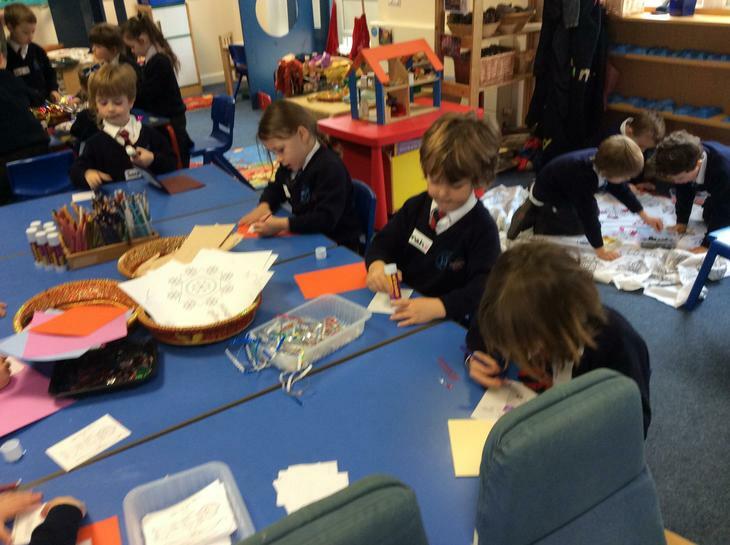 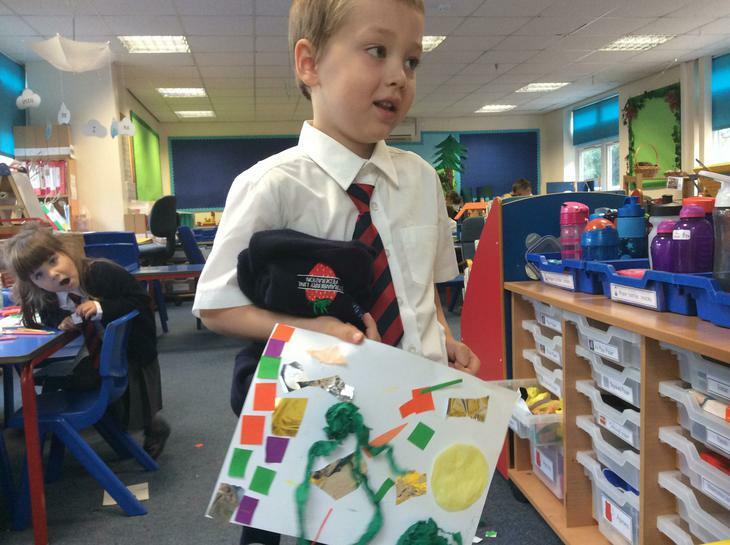 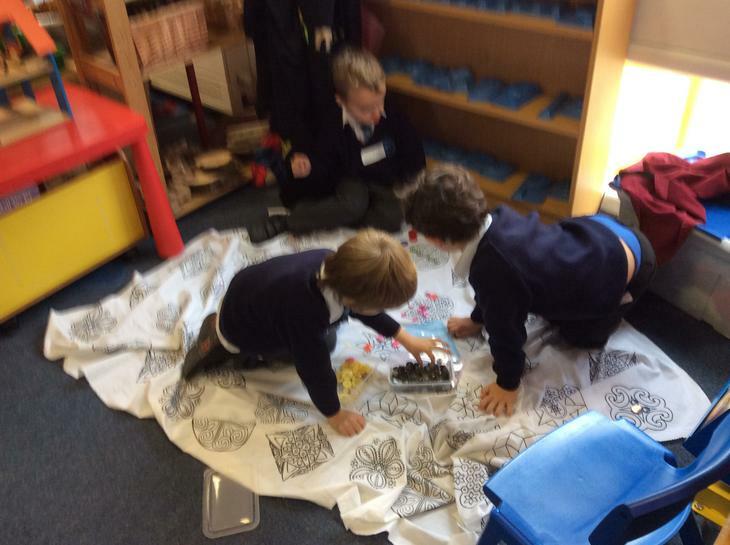 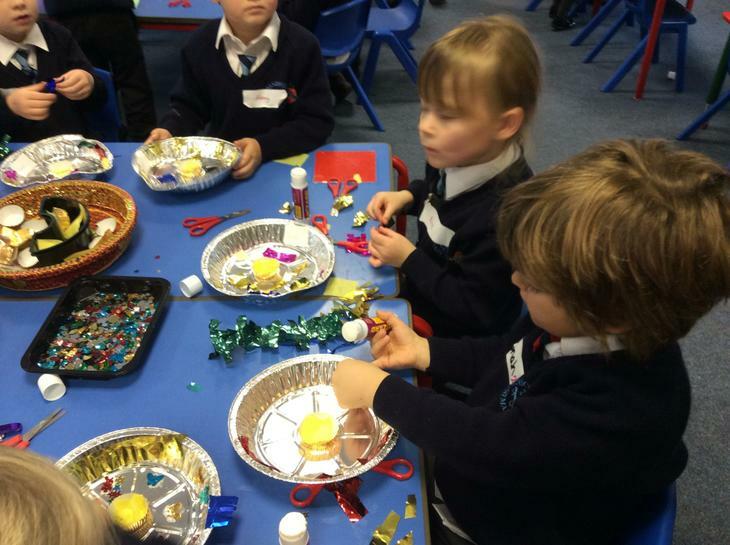 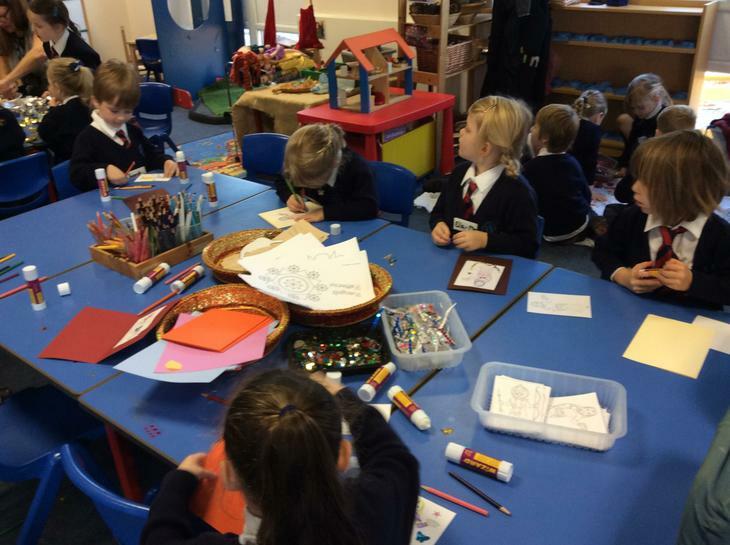 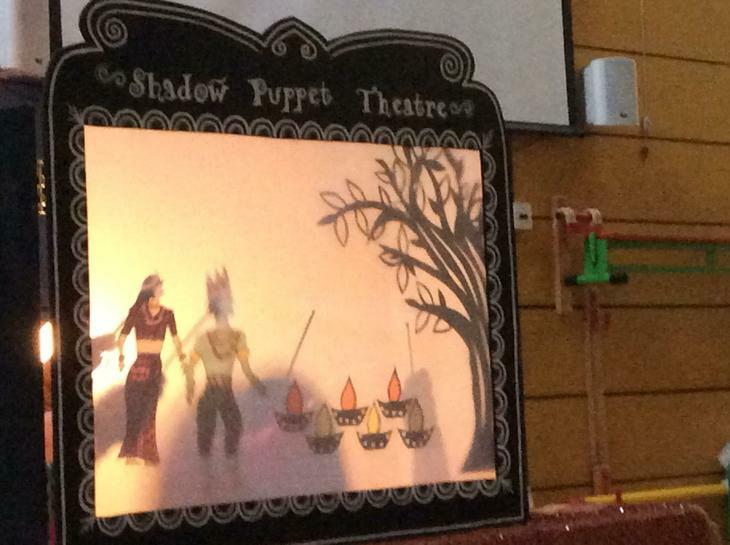 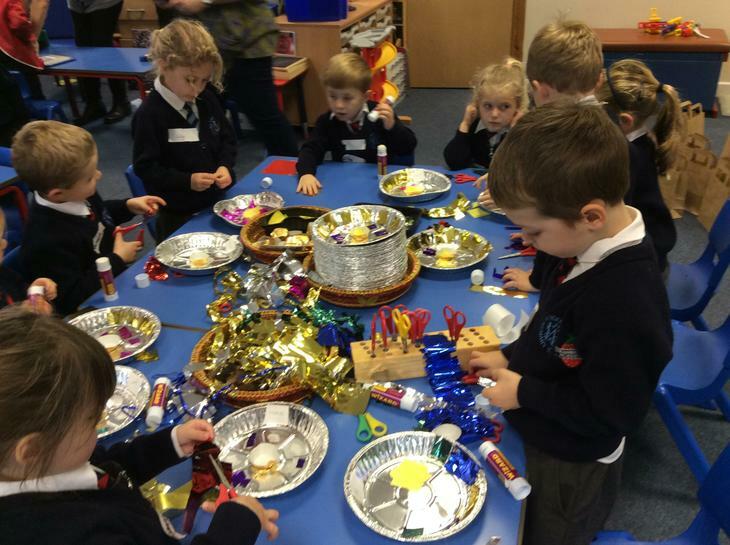 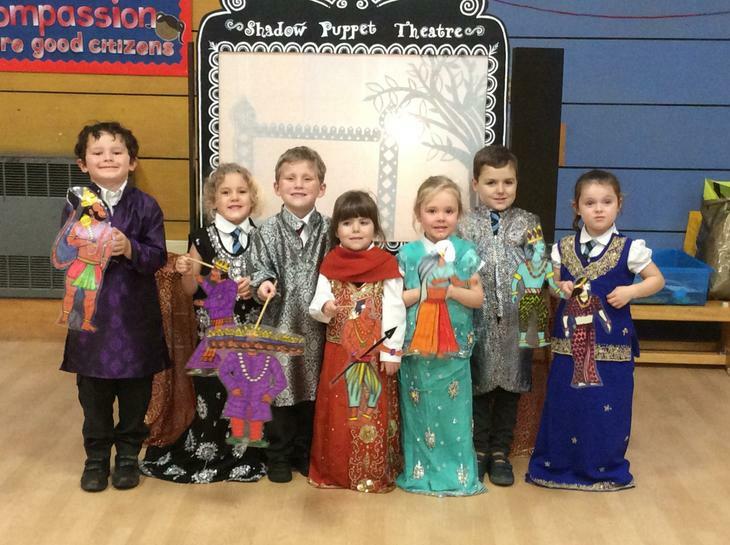 Mrs Mistry told us the Diwali story using puppets, we learnt how to wear a sari, we did Indian dancing, painted diva lamps and made prayer plates. 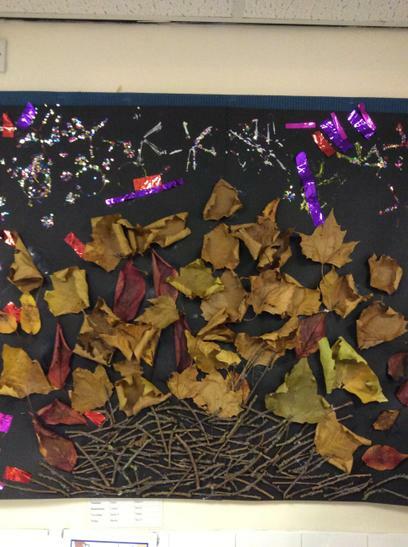 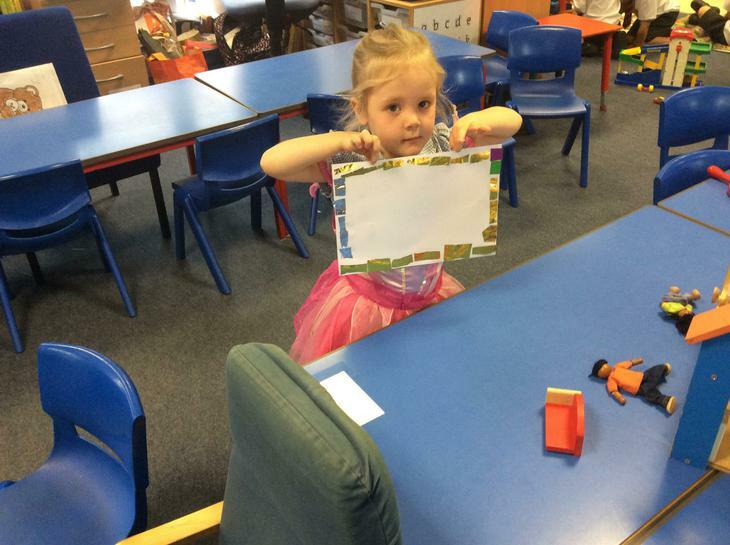 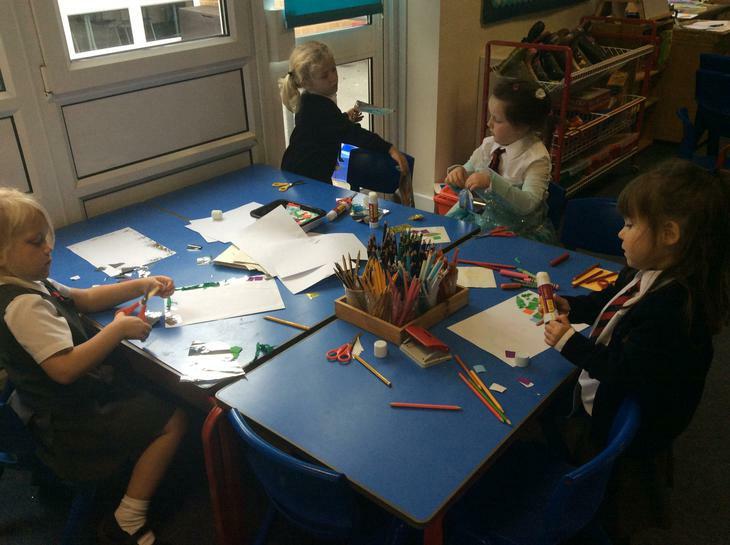 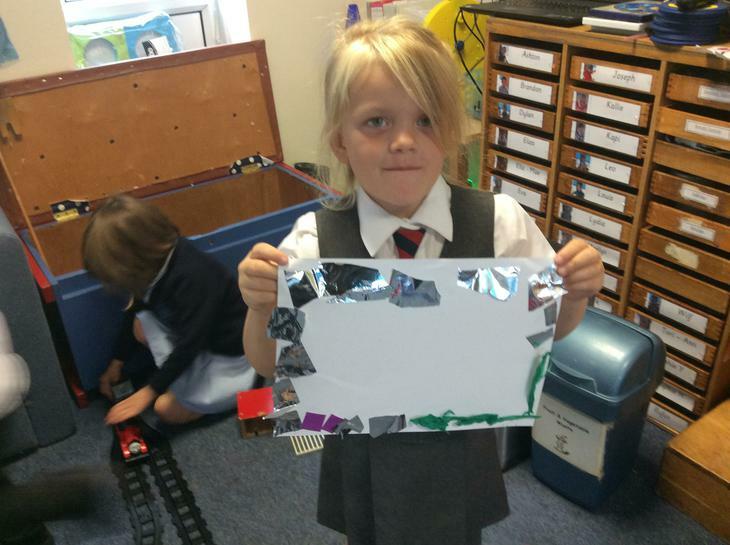 We have made Bonfire Night pictures. 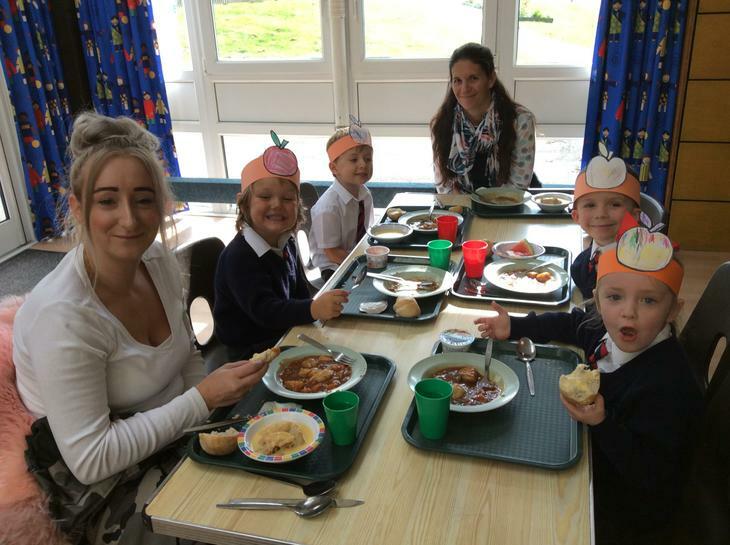 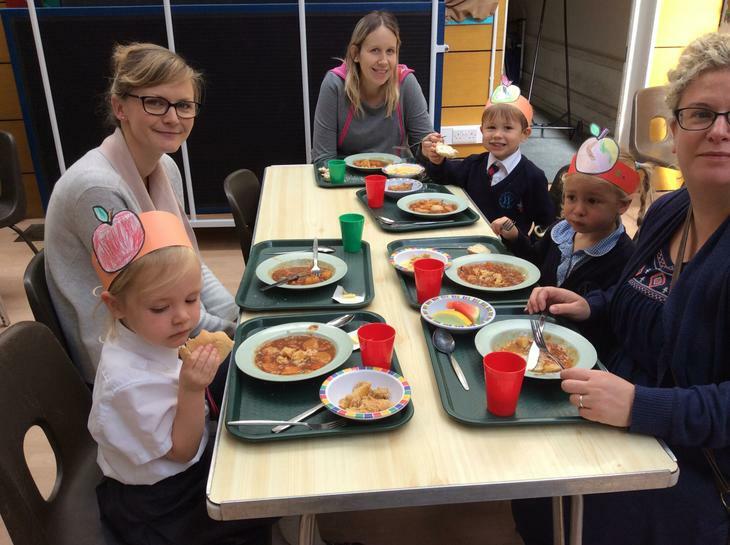 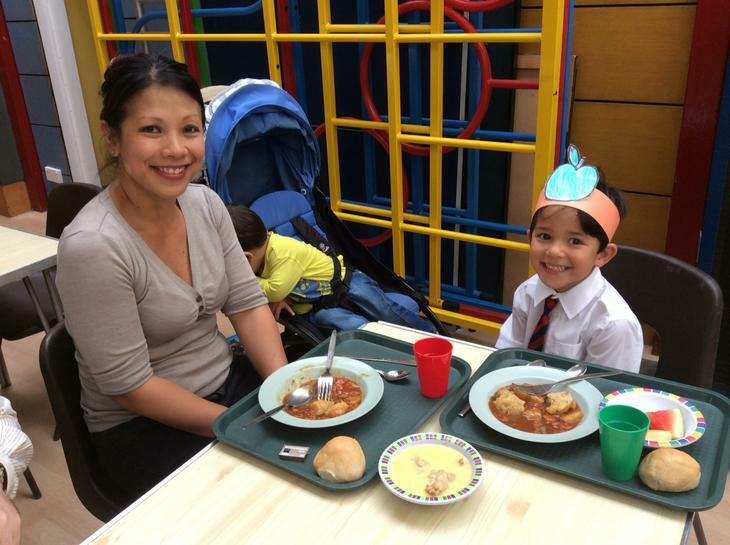 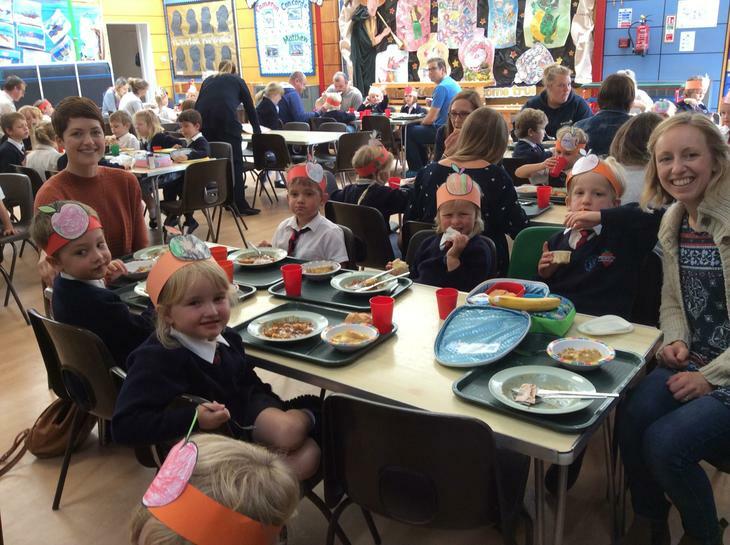 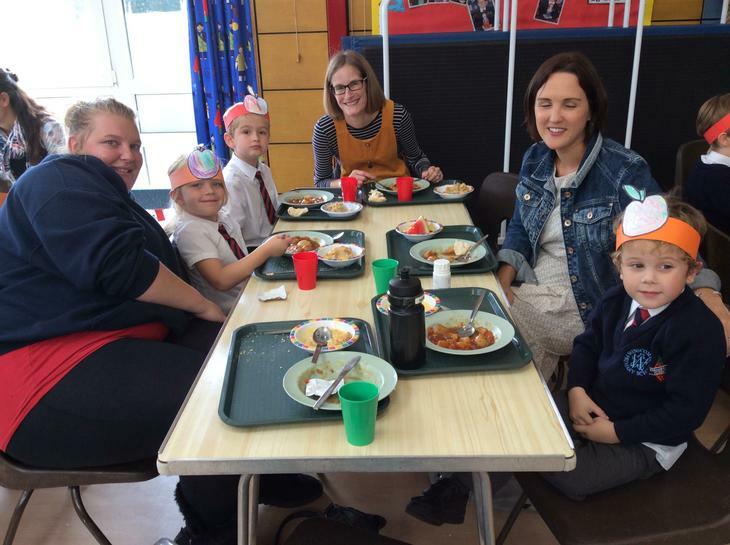 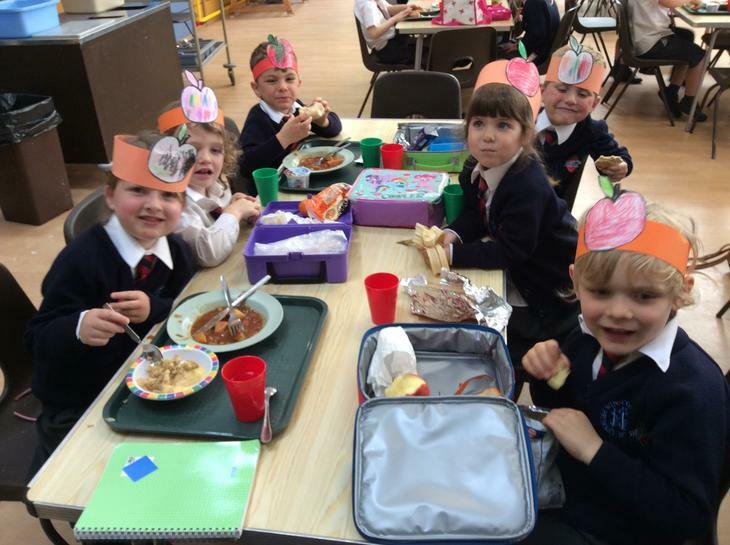 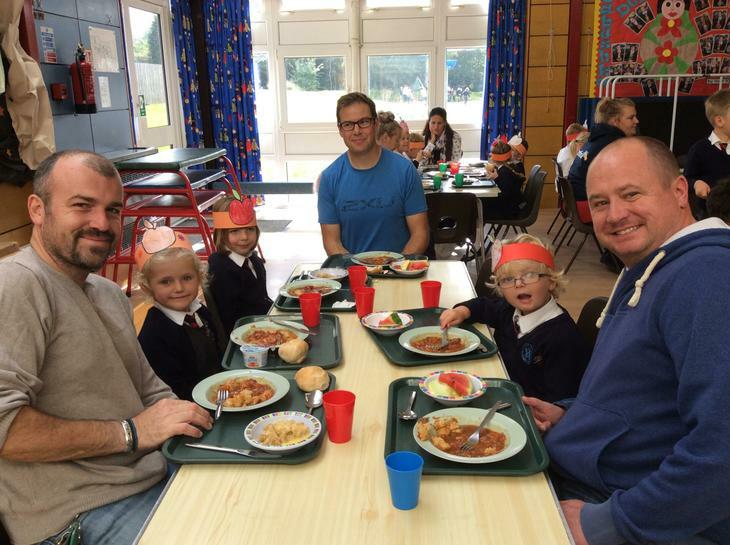 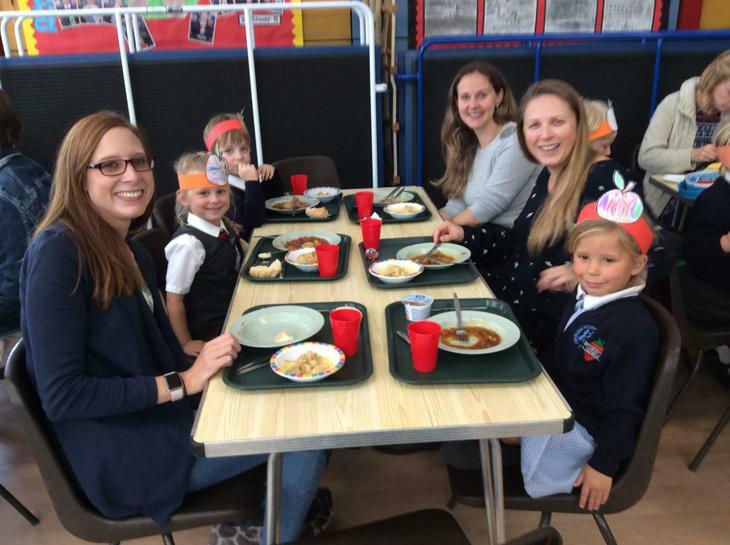 This week we welcomed our parents/ carers in to share a Harvest lunch with us. 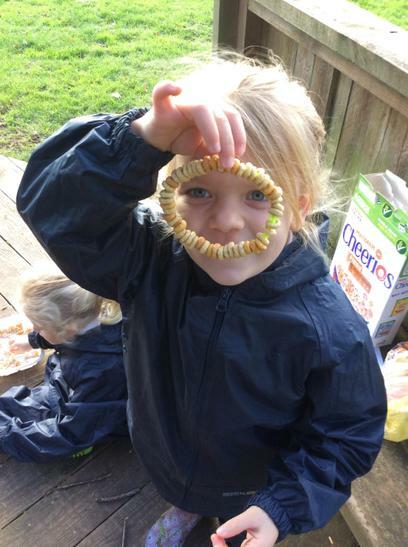 We have been looking at the art work of Andy Goldsworthy and created our own art work from natural resources. 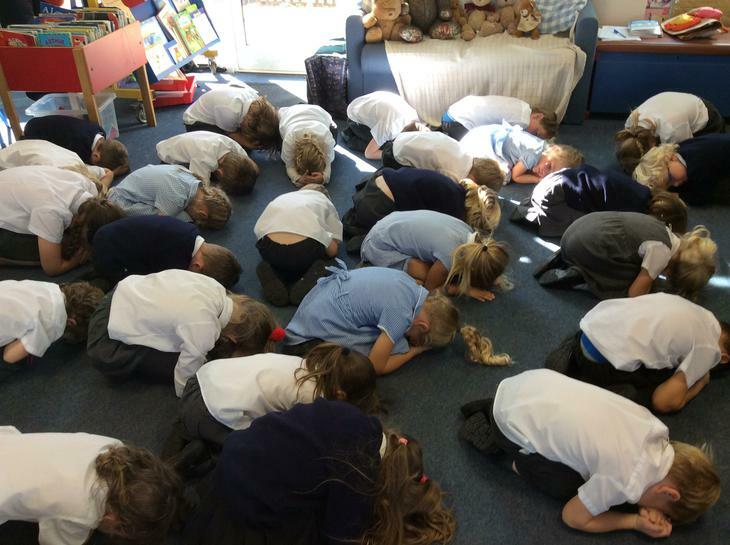 We having been learning about how our body works. 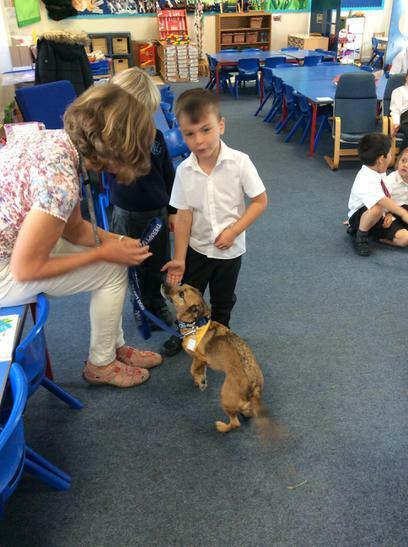 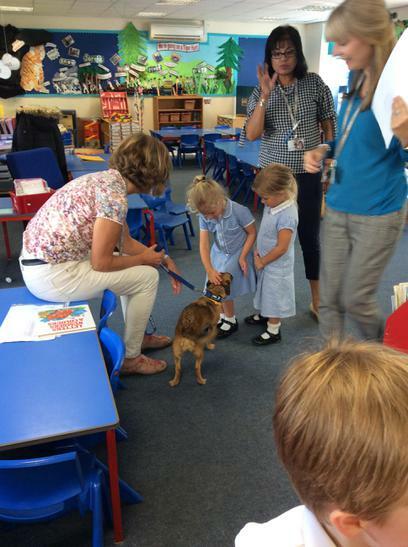 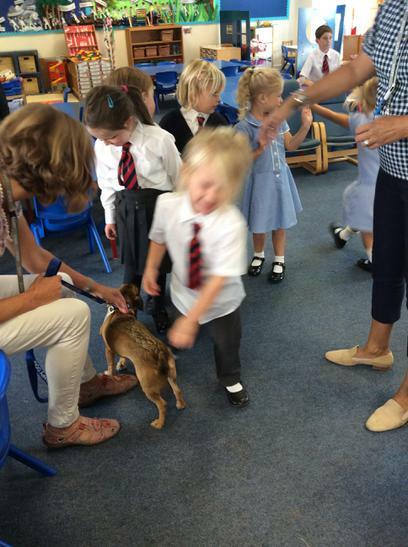 We met Digger, our Reading dog and Mrs Grifffin this week. 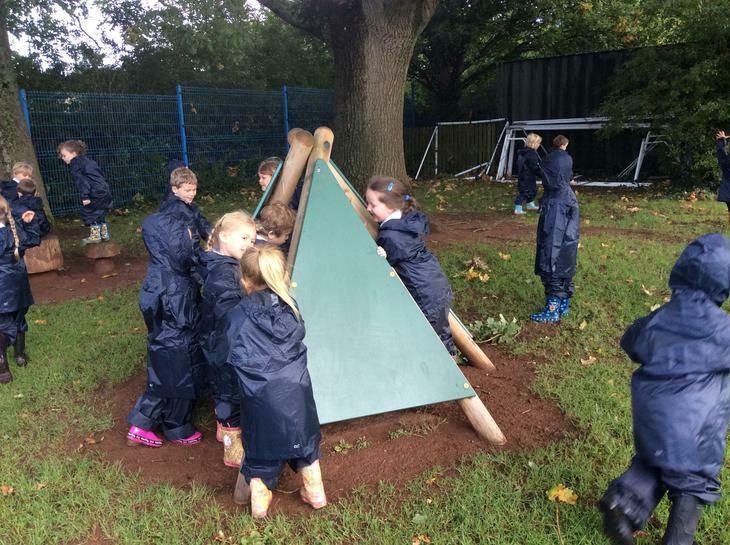 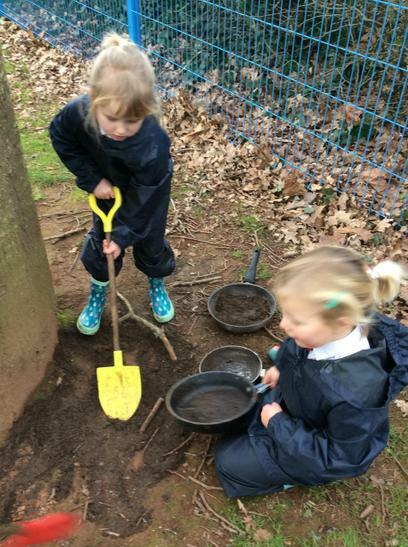 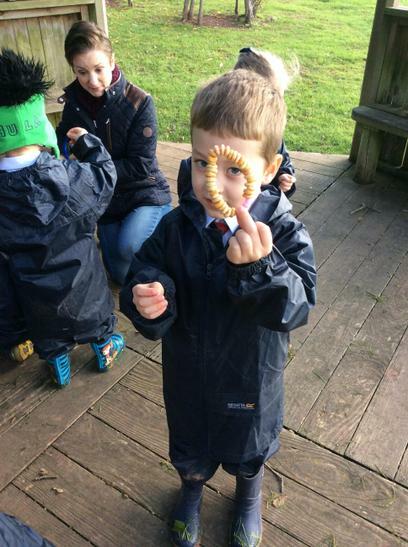 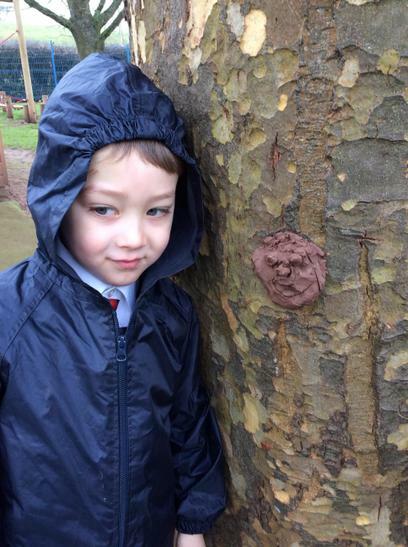 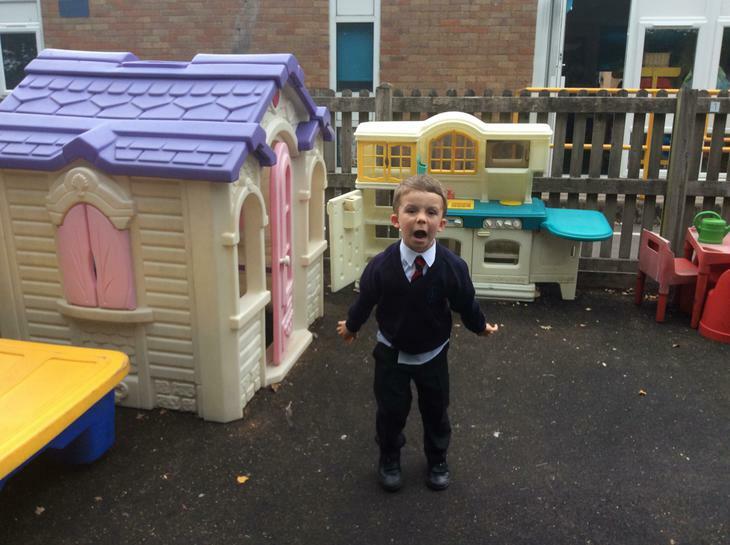 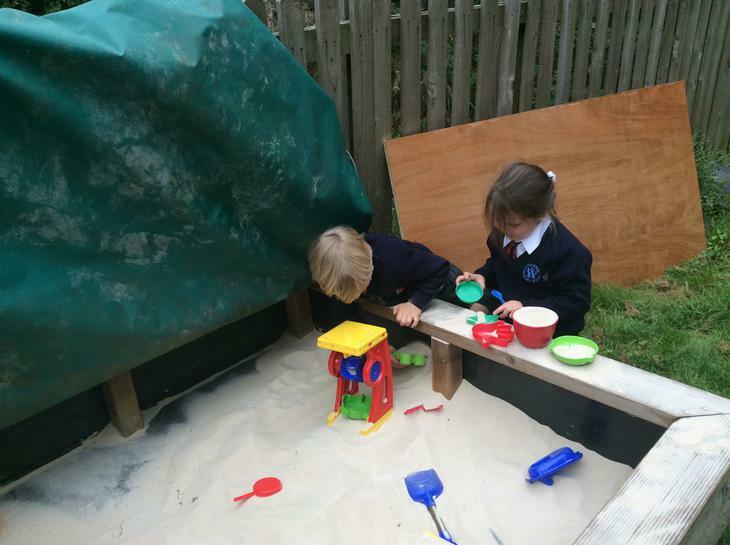 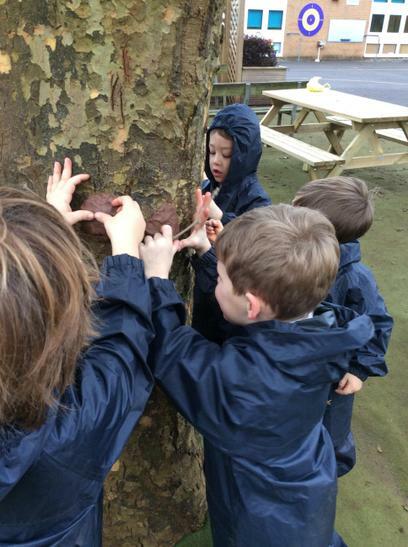 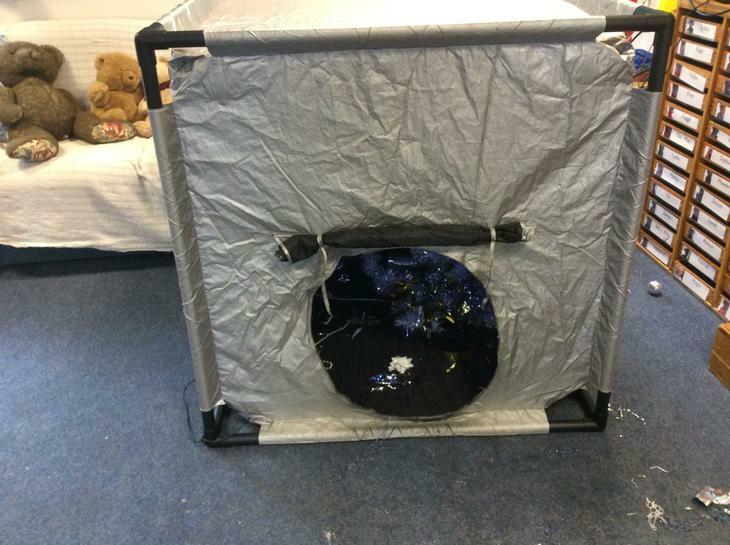 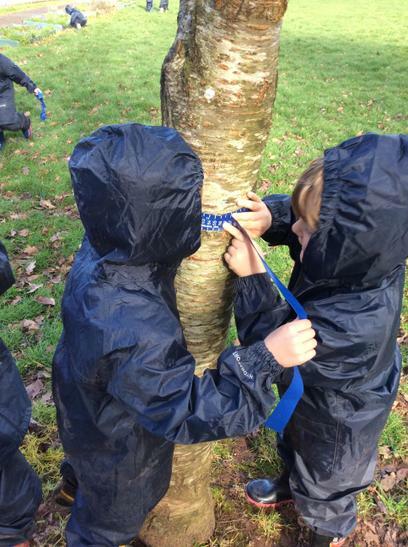 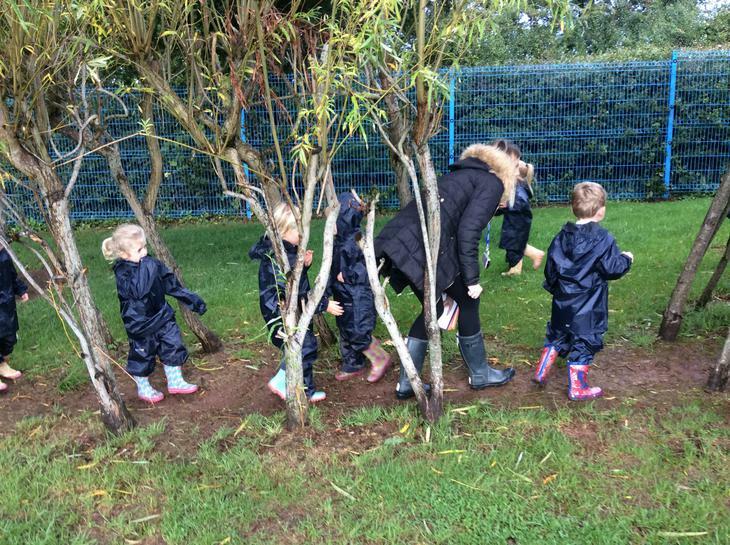 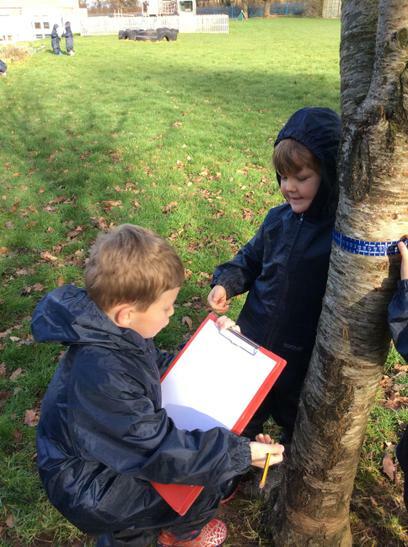 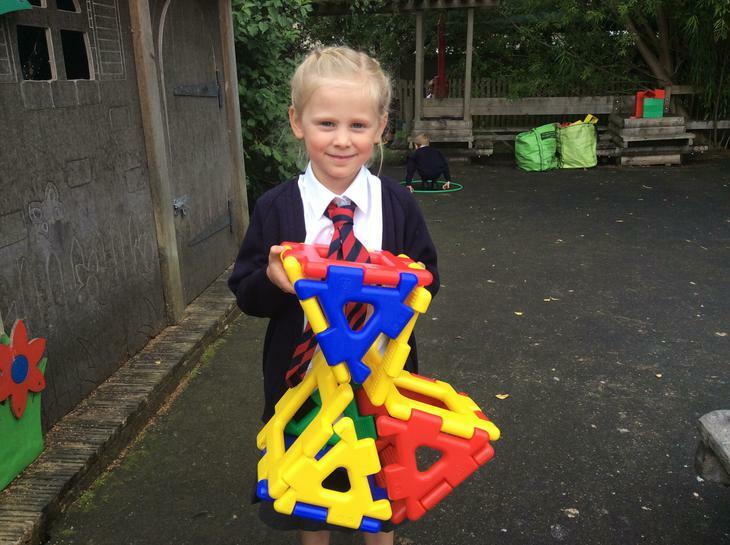 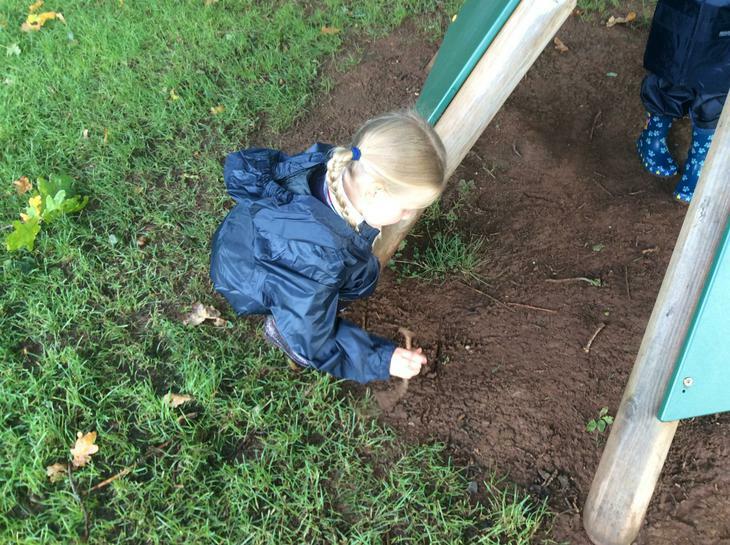 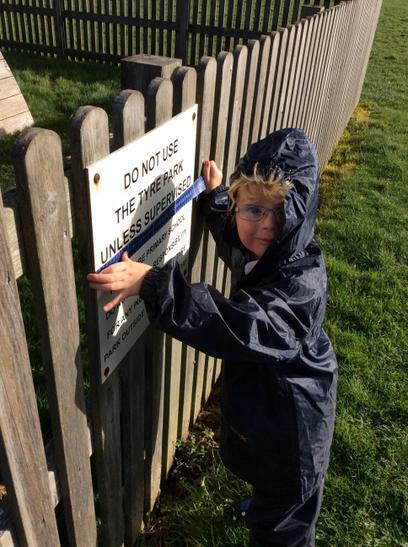 The PTFA have been supporting our 'Outdoor Explorers '. 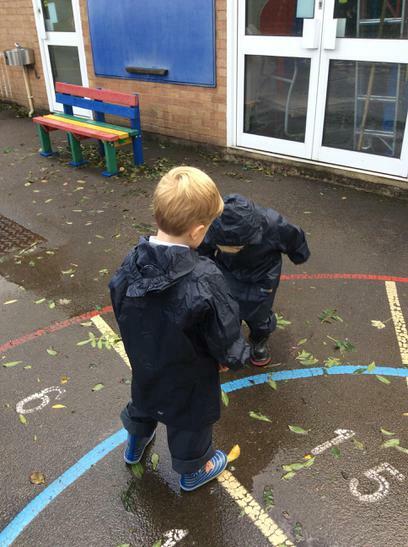 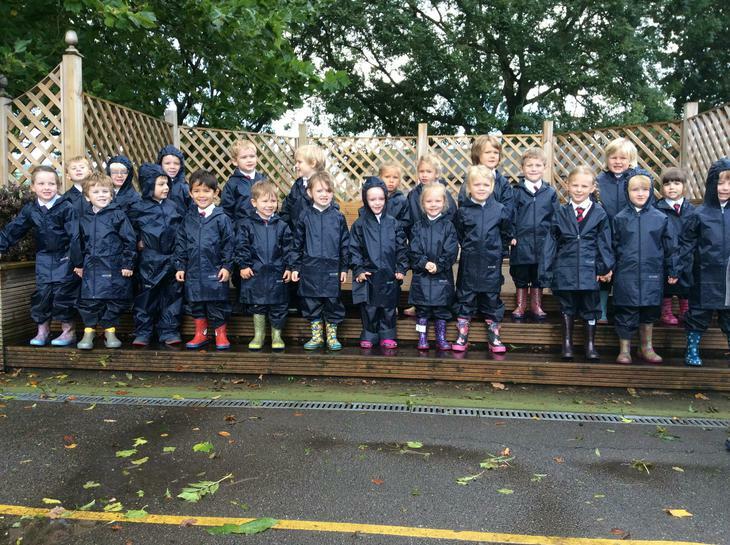 We went on a wet wellie walk in our new waterproofs. 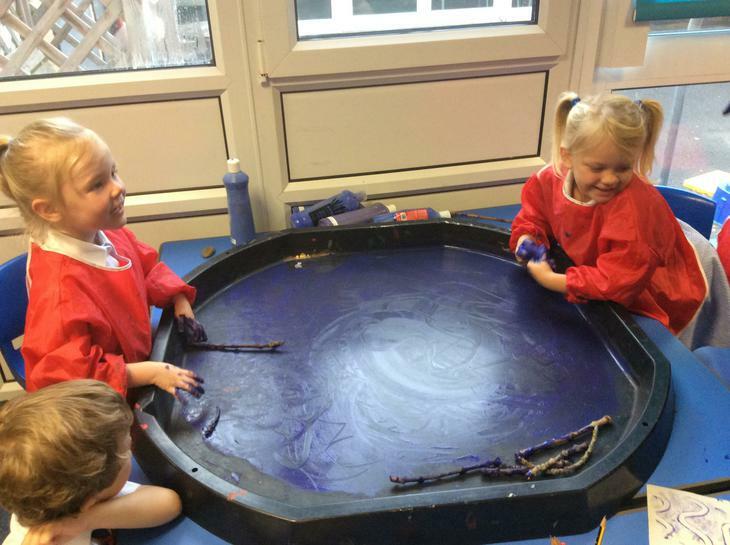 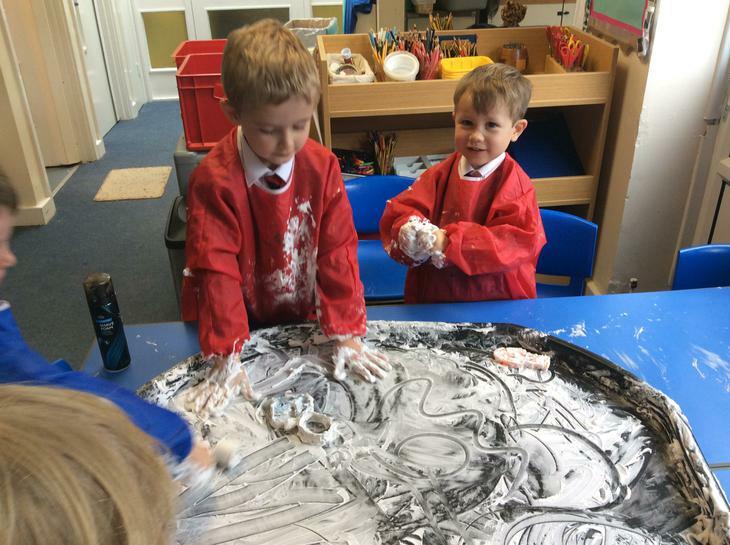 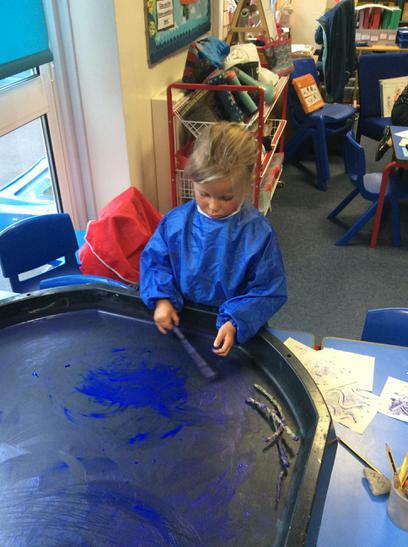 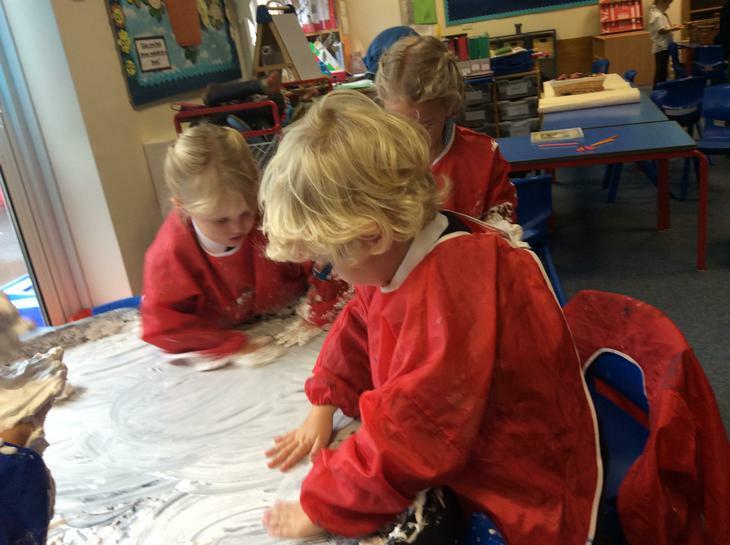 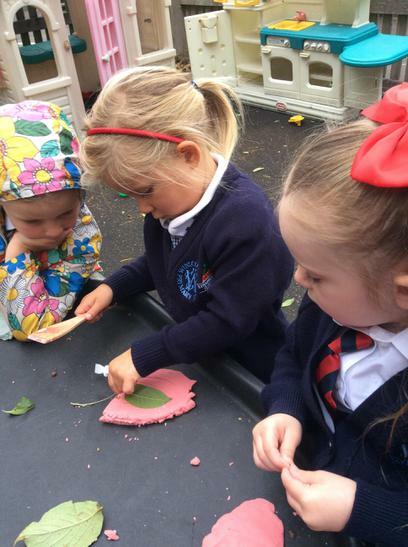 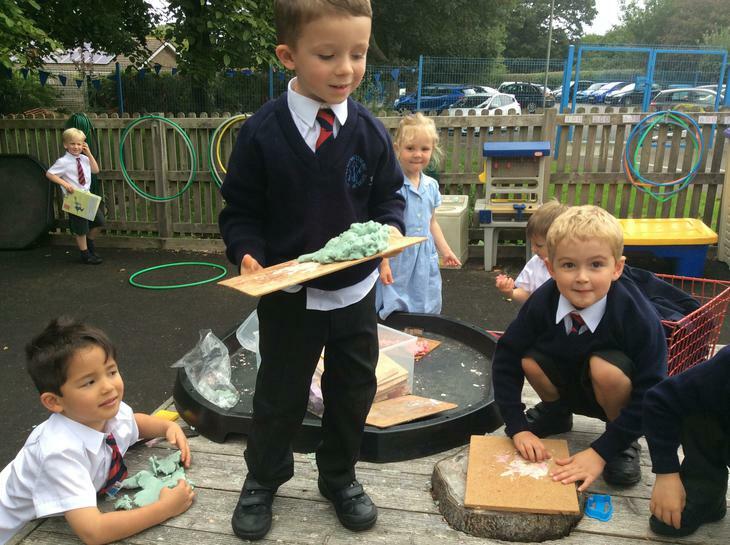 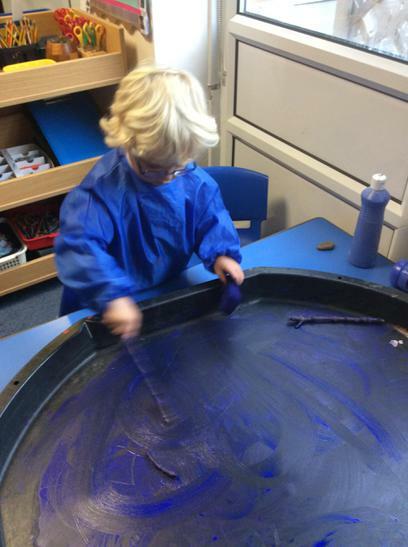 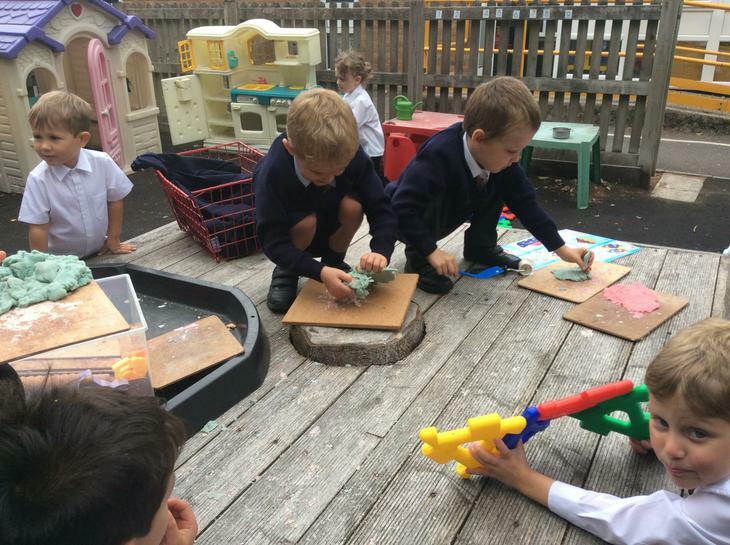 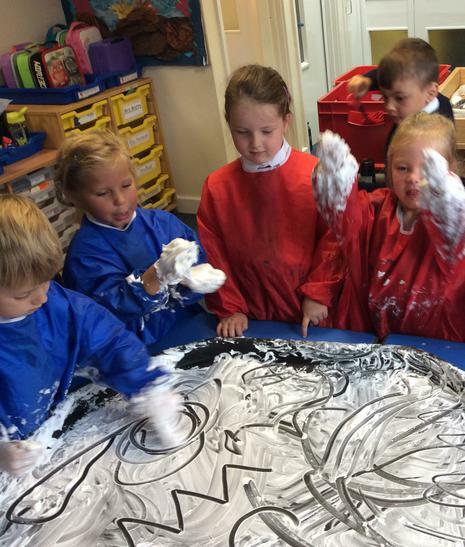 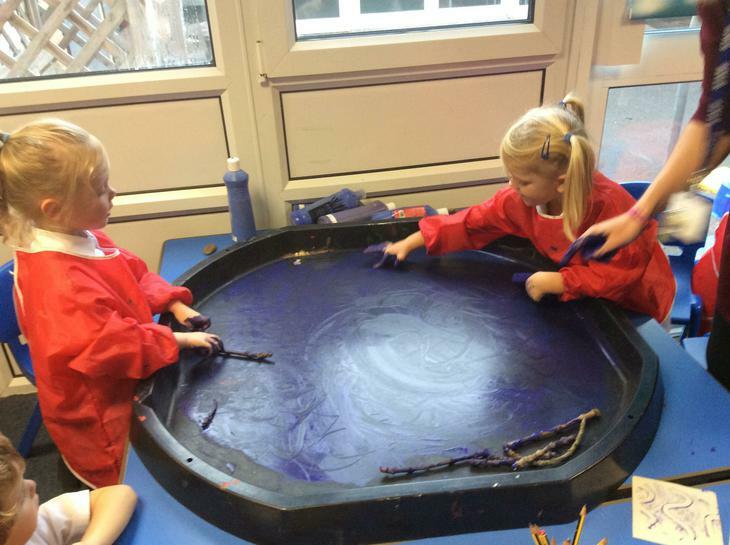 We have been mark making inside and outside. 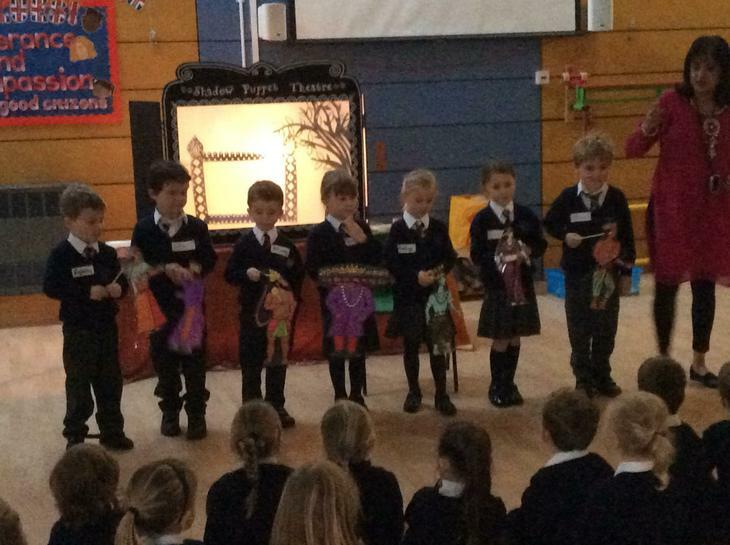 We performed our poem in front of our parents/carers and Key Stage 1. 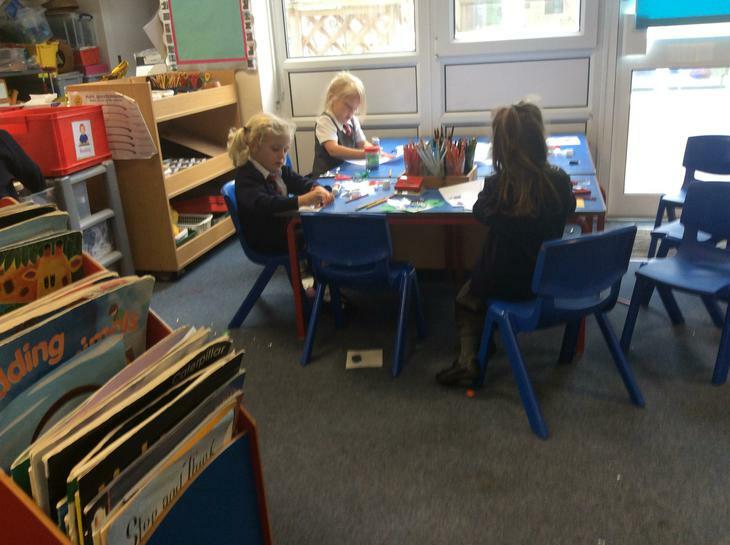 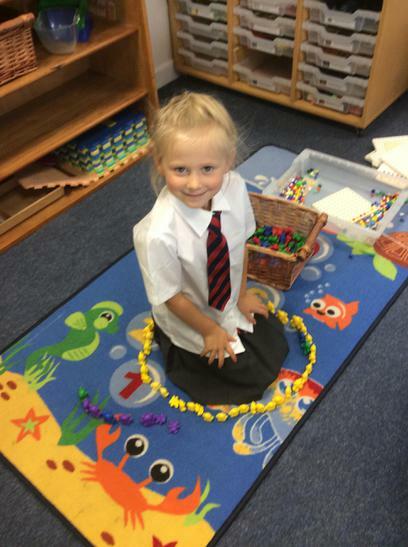 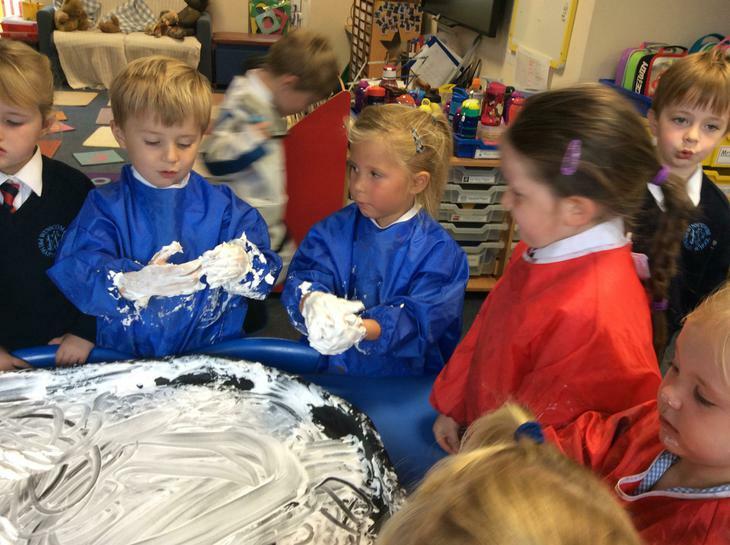 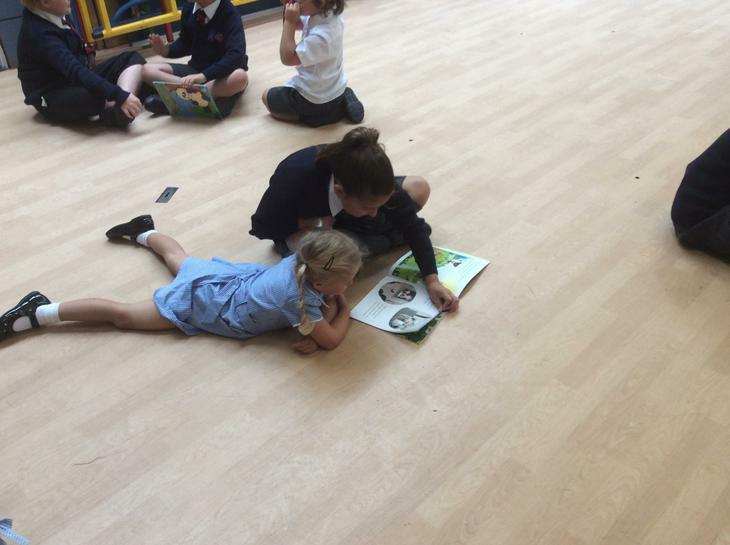 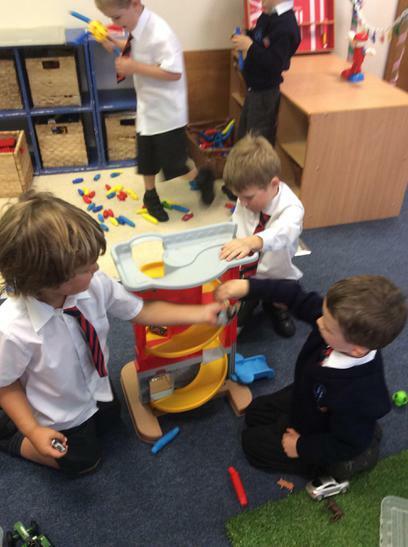 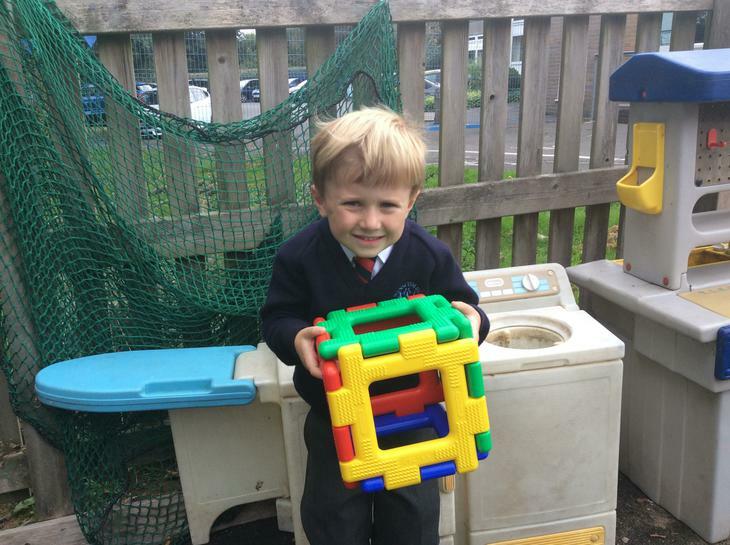 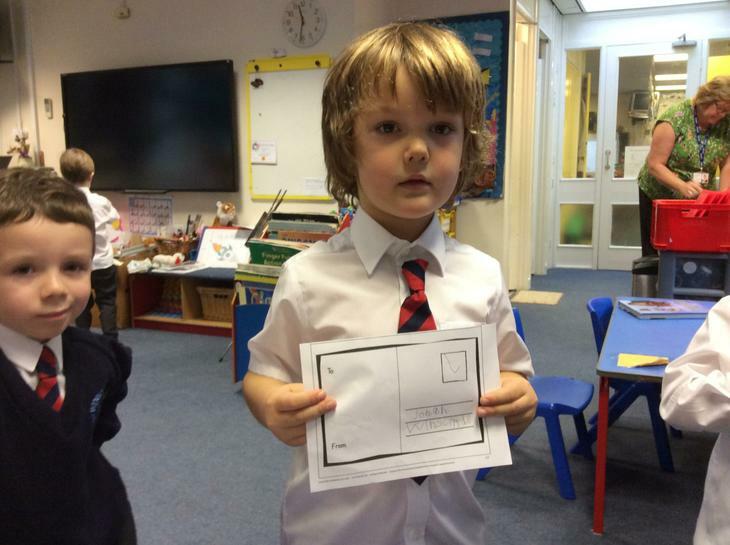 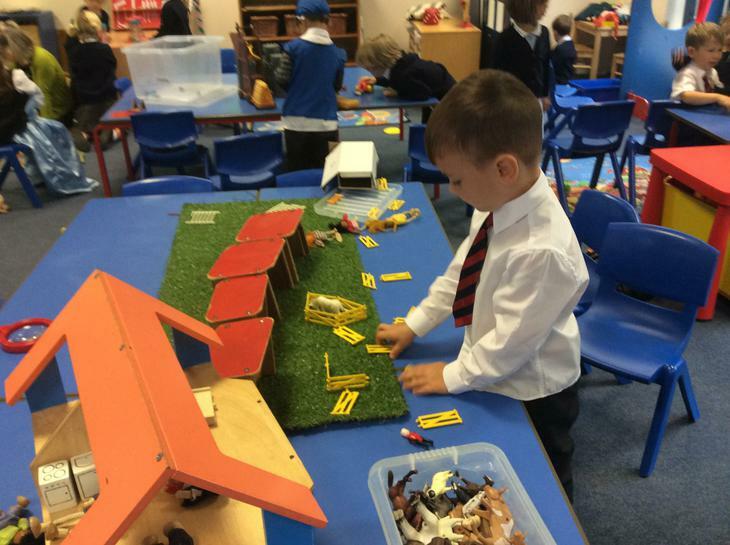 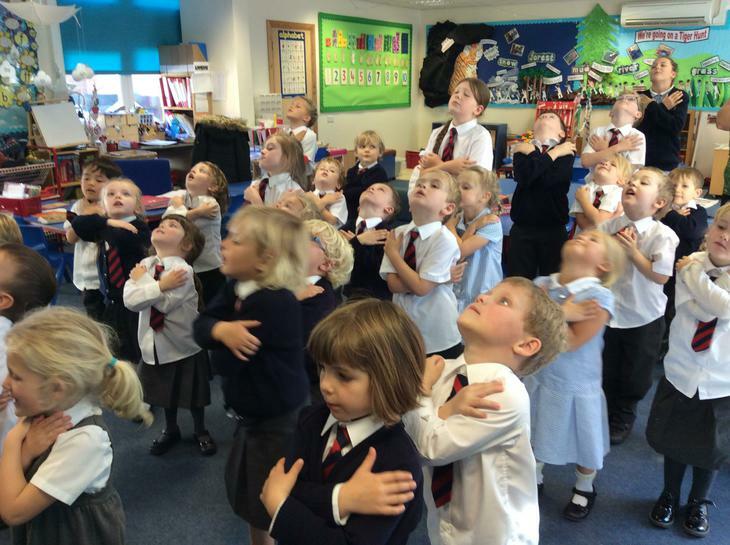 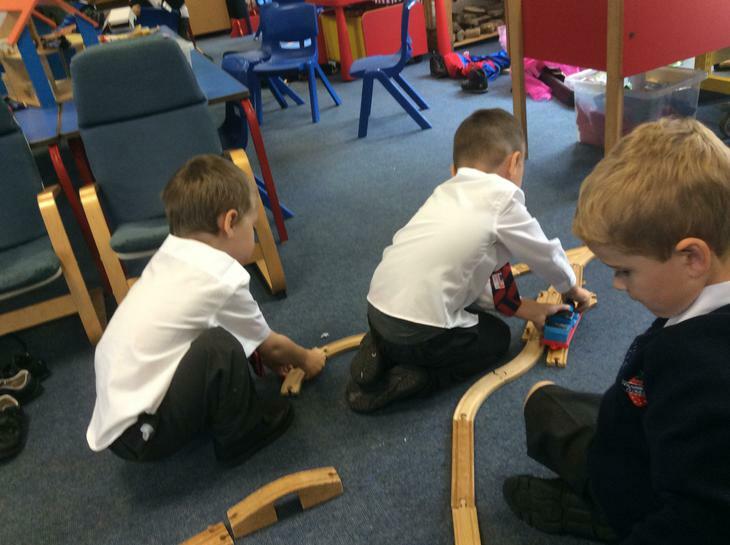 We have had a great first week settling into Red Class.